Values and governance in Australian universities, How should universities be governed and what is the role of government? This paper outlines a number of factors affecting the changing role and organisation of universities and associated shifts in higher education policy. Against that background some comments are made about expectations of university governance, leadership, management and administration. There are many and varied definitions of terms in the literature and a good deal of ambiguity. I am using the following working definitions: Governance is the structure of relationships that bring about organisational coherence, authorise policies, plans and decisions, and account for their probity, responsiveness and cost-effectiveness. Leadership is seeing opportunities and setting strategic directions, and investing in and drawing on people’s capabilities to develop organisational purposes and values. Management is achieving intended outcomes through the allocation of responsibilities and resources, and monitoring their efficiency and effectiveness. Administration is the implementation of authorised procedures and the application of systems to achieve agreed results. accelerating application of Communications and Information Technology to teaching, learning, research, student services and administration. changing nature of academic work, including a shift from ‘cottage industry’ to ‘mass production’, specialisation of curriculum design and assessment functions, and rising expectations of output and self-generated earnings. the new providers have characteristics that challenge the markets of established universities and require them to transform their operations and organisation. Such features are: borderlessness; earner-learner focus; convenience; customisation; modularisation; applied learning; practitioner-teachers; and disaggregation of design, teaching, assessment and student service functions. arrangements for mutual recognition of higher education qualifications need to be inherently robust in order to protect national interests, including through revisiting bilateral agreements entered into before the onset of e-education; they also need to be renegotiated in the understanding of potent international developments, including the emergence of IT and other qualifications that are recognised outside national frameworks, and opportunities for Australia to access global markets and the reciprocal rights of foreign providers to service domestic markets. universities with limited capacity to invest in new educational technologies, and with cultural, governance and industrial restrictions on their operating flexibilities, will find the future ever more difficult. strengthening their international links with the scholarly community. To some extent we are already seeing a more outward-looking approach and service orientation among Australian universities, with some internationally pace-setting innovations in educational design and delivery. This is partly driven by their greater need for self-reliance in respect of revenues, causing them to face the market rather than be too dependent on government alone. The increasing engagement of the universities interestingly gives rise to higher expectations of them and from more diverse interests, as knowledge becomes more integral to social and economic activity. However, some expressions of this interest are double edged. On the one hand, engagement of universities with the practical concerns of enterprises and communities has beneficial two-way flows, including for teaching and research. On the other hand, service contracting links costs and benefits to discrete activities that involve some parts of the university more than others, requiring sensitively hard-nosed policies for the internal distribution of resources. Various government bodies too -- Commonwealth and State/Territory, departments and agencies, across several portfolios – are developing specific-purpose relations with universities with tighter conditions attached to their financial contributions, including matched funding and dedicated use of resources, so reducing university discretion. At the same time, new forms of constraint are operating on universities’ commercial activities through changes to corporations law and other State/Territory regulations. And some are now pressing for even tighter conditions on funding, including input controls, greater external directing of IP management strategies and stricter regulation of commercial activities. Questions of balance arise, both for universities in managing their internal tensions according to their diverse missions and values while adjusting to market realities, and for public policy in maintaining universities as organic institutions while purchasing outputs from them as service providers. In socially valuing the role that universities can play as contributors to national innovation and cultural vitality, prudent policy would give them adequate room to experiment and explore, adapt and diversify – while expecting that they will function responsibly and cost-effectively and be publicly accountable for so doing. The quid pro quo for allowing universities a high degree of autonomy is that they themselves have the necessary capabilities for professional governance and competent management. If universities cannot themselves initiate and carry through the necessary reforms to their organisation and operations either they will not survive in their current forms or outsiders may make decisions for them through very restrictive service purchase arrangements or administrative prescriptions. and sufficient financial and other resources to enable the institution’s programme to be delivered and sustained into the future. enable individuals to contribute to a democratic, civilised society and promote the tolerance and debate that underpins it. ensure public accountability for the cost-effective use of public resources. In law universities effectively own themselves and are essentially autonomous. They are able to determine whom to admit as students, whom to employ as staff and the conditions of their employment (subject to relevant industrial legislation and awards), what to teach, how to teach and how to assess learning (subject in several fields to the requirements of professional bodies regarding accreditation of graduates to practise) what research to undertake and how to conduct it (subject to competitively winning funds for major projects from research funding agencies), what to publish and how, when and where to publish research findings (subject to peer assessment). They can normally (subject to State/Territory laws and regulations) invest, divest and borrow in respect of property and commercial ventures. Their assets, whether obtained through private donations or government grants or the proceeds of investment, unless specifically encumbered as to their use purposes, belong to the university and can be used or disposed of, consistent with State and Local government regulations, in accordance with the purposes of the university and the powers of the council. In effect, public universities can and do operate commercially; however, the proceeds of their activities must be directed to the public purposes of their establishment. A university can do what a university can do. It is ascertaining the boundaries of these activities that is problematical for a university’s commercialisation activities. In the absence of express powers, assistance as to what can be done by implication is to be gauged from the collective experience of universities in Australia. So the fact that universities generally exploit intellectual property generated by their employees can be taken to indicate that this is an activity that falls within the ambit of university activities. The absence of an express power would not therefore prevent a university so acting. But it would be necessary to establish that it was a recognised university activity. Australian universities generally enjoy greater degrees of freedom than their international counterparts in Europe (less so for the UK), North and South America, Africa, the Middle East and Asia. Practice varies across countries but the following features are common to many: universities are obliged to admit students who meet centrally-determined criteria; staff are public servants engaged under conditions that universities cannot influence; course offerings and curriculum content are subject to central government approval; assessment is based on central examinations; research is permitted only in designated institutions and publications are subject to government clearance; university budgets are allocated annually on a line-item input basis; universities cannot commit expenditures to projects of more than one year’s duration. University assets are owned by the state; universities cannot invest, borrow or divest without project-specific central approval. The autonomies of Australian universities underpin academic freedom and international competitiveness. The extent of university autonomy enjoyed in Australia is occasionally queried on the grounds that universities by their actions are insufficiently responsive and accountable. University autonomy seems presently to be under attack from various quarters whether for being insular and self-indulgent, or insufficiently contributing to community debate on and resolution of social issues, or inappropriately risking public assets, or inadequately responding to industry needs or economic development opportunities. In defence of autonomy (without being romantic or normative) we need to appreciate the special contribution that universities can make to the intellectual and creative culture of the society, as well as to national and regional economic development, and acknowledge the latitude they need to so contribute in diverse ways. We also need to value plurality in higher education as an ingredient of a functioning democracy while accepting the fact of rapid and unpredictable shifts in the formation of knowledge across disciplinary and institutional boundaries. We are wise to take a long-term view and conceive broadly of humanity and social values to permit intellectual pursuits that may not have apparent application nor be fashionable or comfortable at a particular time, while also enabling speedy application of ideas to develop market opportunities and address social needs. We should also acknowledge that for the bulk of their business the universities are practically oriented, whether in preparing graduates for entry to professional occupations or in undertaking research and consultancy services relevant to industry and community needs. The ability of universities to operate across the range of these activities is important to functional coherence, operational efficiency through the internalisation of costs, and risk reduction through the spreading of investments. Hence the sense in taking a whole-of-university approach in state-university relations, focussing on obtaining educational outcomes rather than preoccupation with accounting for inputs. That said, the universities need to be able to explain why they have exercised their discretion in various ways and account for the ways they have used the resources available to them and the results they have achieved. They should also be prepared to provide information that assists the community in appreciating what they are doing, including information about student access, course provision, student success and staff achievements. Community support for universities and their activities is likely to reflect the visibility of their contributions. The Commonwealth as a major stakeholder has certain interests and responsibilities in ensuring public accountability at least in respect of the funds it provides to universities (directly and indirectly) and the services it buys from them, and more broadly in sustaining a cost-effective national system of internationally recognised quality, and promoting institutional responsiveness to varying student and community needs. However, universities have several external stakeholders, including their alumni, employers of their graduates, professional associations and international research collaborators. Not the least important external stakeholders are the State &Territory governments that establish universities by statute, define their purposes and powers, and determine and make appointments to their governing councils. The annual reports of a university are required to be tabled in the Legislature that established it and its financial statements of revenues and expenditures, assets and liabilities, including for its controlled entities, are subject to audit by the respective State/Territory Auditor-General. The Commonwealth obtains copies of the audited financial statements, annual reports and strategic plans of universities. These are analysed by the department and discussed with each university during the annual rounds of institutional profiles discussions. The Commonwealth provides both general purpose operating grants to universities for teaching and related purposes, and specific-purpose grants for particular projects, including research activities. Performance-based formulae are used for allocating funding for research student places, research infrastructure, equity and Indigenous education support. Universities provide financial acquittals annually to the department. The claims that universities make about the quality of their teaching, research and administration are subject to external verification by an independent audit agency, the Australian Universities Quality Agency. Additionally, the department publishes comparative university performance information on a regular basis, including information designed to assist student choice. The department also invests in analysis and evaluation of developments, the dissemination of good practices and the development of tools to assist in management improvement (such as costing methodology studies, benchmarks, and surveys of graduate destinations and graduate and employer satisfaction). Australia is regarded within the OECD as a world leader in the regular public provision of higher education information and analysis. All in all, Australian universities operate within a rigorous and comprehensive public accountability framework, balancing their considerable autonomy. This framework extends beyond the publicly-financed functions of universities which now represent only around half their activities. The governing body exists to oversee the development and adoption of institutional strategic plans and key policies, to monitor and review the institution’s overall performance and to bear ultimate accountability for the institution. Its activities should be principally those of guidance and review, rather than executive management, and its members should recognise their overriding responsibility to bring diverse viewpoints together for the advancement of the institution rather than to represent sectional interests. The Hoare committee drew attention to the need for smaller, more capable councils better supplied with information on which to base decisions and equipped with people having the skills they need to do their job, through improved processes for appointment, induction and training. Modest improvement has been made in several universities since Hoare reported. Yet the roles of councils (except in a few universities) are still not clearly defined. There continues to be a tension between the ‘trustee’ (custodian) role expected of a council member to progress the best interests of the university and the basis on which some of them are appointed, and continue predominantly to act, as ‘representative’ (delegate) of internal interest groups. This is a serious matter. Several Vice-Chancellors in recent years, who endeavoured to make management improvements for the strategic advantage of their university, have been rolled on the vote of representative interests of council members. Were these people subject to the normal requirements of company directors they may well now be suffering penalties. There are also some operational deficiencies. It is not common practice for university strategic plans to be linked with budgets and performance measures, nor for councils to receive regular financial reports. While universities should be able to improve their net operating results from their various business undertakings and demonstrate to their current and potential partners that they have business competence and transparent management practices, not all investments are adequately assessed for costs-benefits and risks nor adequately monitored for their performance. Scope also exists for management improvement in various areas, notwithstanding the significant advances made over the past decade in the development of policies, procedures and systems, and the gradual professionalisation of central administration, including for commercial activities where performance has been volatile. Admissions are closely controlled in most universities but less so in others, as reflected in excessive levels of over-enrolment. Student services are efficient and customer-sensitive in some universities but not in others, and most have yet to develop customer management systems. Market analysis is undertaken well in several institutions but not at all in others. There is variability in the efficiency of financial, asset and human resources management. Universities are on the whole lagging well behind other institutions in identifying and collaborating on ways to reduce back office inefficiencies, such as for transaction processing, fleet and property management. The role of the NTEU as a national gatekeeper in respect of enterprise bargaining, in setting normative salary outcomes (irrespective of institutional capacities) and vetoing agreements of local staff to more flexible organisational arrangements, is a serious restraint of bargaining autonomy and, hence, impediment to institutional responsiveness and diversification. Since enterprise bargaining commenced in the university sector in 1995 very little progress has been made in the critical areas of performance management (such as for dealing with under-performing staff) and operating times (such as a three session year and weekend classes) despite changes in the characteristics and circumstances of students. Universities risk losing market share if they are unable to match competitors who can offer convenient programs (7days/24 hours is now international practice) customised to suit individual needs (including options to pay for additions to their core requirements) at reasonable prices and comparable quality. Indeed, this is already happening. The imperative is not for more external regulation and restriction, which would fetter universities, reduce their flexibility and diminish their capacity to deliver the contributions the community needs and for which it affords them special status, but for greater internal coherence and competence. Bỏ thi “ba chung” hay không? Có thể sử dụng kết quả kỳ thi THPT guốc gia để xét tuyển ĐH, CĐ? Chọn mô hình xét tuyển nào nếu bỏ kỳ thi tuyển sinh ĐH?… Đó là những câu hỏi "nóng" tại Hội thảo “Đổi mới tuyển sinh ĐH-CĐ tại Việt Nam” tổ chức tại ĐH Quốc gia TP HCM ngày 19/12. Phó giáo sư, Tiến sĩ Nguyễn Kim Hồng, Phó hiệu trưởng ĐH Sư phạm TP HCM, cho rằng Bộ GD-ĐT cũng đang mâu thuẫn trong việc xác định nên hay không nên tổ chức một kỳ thi tốt nghiệp THPT quốc gia và dùng kết quả đó để xét tuyển vào ĐH, CĐ. Bà Kim Hồng nói: “Kỳ tuyển sinh năm 2008, tôi thông báo với cán bộ coi thi và thí sinh có thể đây là kỳ thi tuyển sinh cuối cùng. Sau đó bộ thông báo lại là năm 2009, giờ chẳng biết có không nữa?”. Đồng tình với ý kiến trên, Tiến sĩ Nguyễn Đức Nghĩa, Phó giám đốc ĐH Quốc gia TP HCM, bổ sung: “Năm 2008 đã có thể là kỳ thi cuối cùng. Giờ 2009 cũng có thể. Cứ thế này chẳng biết bao giờ mới chính thức”. Ớ khía cạnh khác, Tiến sĩ Nguyễn Tiến Dũng, Trưởng phòng Đào tạo ĐH Sư phạm Kỹ thuật TP HCM ủng hộ tuyển sinh “ba chung” của Bộ GD-ĐT từ năm 2002 đến nay, vì các trường không phải lo in sao đề thi, chỉ lo tổ chức thi. Tuy nhiên, cũng chính vì “ba chung” mà Bộ GD-ĐT lo hết, các ĐH, CĐ không được tự chủ. Để cải tiến công tác tuyển sinh và nâng cao chất lượng, Tiến sĩ Dũng đưa ra đề nghị: “Bộ phải nhả ra, không nên cứ ôm khư khư. Hãy để cho các trường tự chủ, bộ chỉ quản lý, theo dõi, đánh giá mà thôi”. Ngoài ra, chính các chính sách không nhất quán của Bộ GD-ĐT cũng làm cho tình hình thêm phức tạp. Nhiều đại biểu cho rằng việc bộ kêu gọi phân luồng học sinh, nhưng lại cấm học sinh trường nghề thi ĐH, CĐ năm 2009 là một minh chứng. Tiến sĩ Đức Nghĩa nhìn nhận: “Chúng ta đang cố gắng phân luồng học sinh học nghề để đáp ứng nhu cầu lao động của xã hội, của công nghiệp hóa - hiện đại hóa. Giờ cấm thì đố học sinh nào dám theo học”. Theo Tiến sĩ Lê Khắc Cường, Trưởng phòng Đào tạo ĐH Khoa học xã hội và Nhân văn TP HCM, hình thức “ba chung” đang thực hiện dẫu chưa phải đã nhận được sự đồng thuận hoàn toàn của các trường và toàn xã hội, song nó có những ưu điểm không thể bác bỏ. “Ưu điểm nổi bật nhất là giúp chúng ta có một đánh giá khá chính xác về mặt bằng học vấn của thí sinh trên cả nước”, Tiến sĩ Khắc Cường nhấn mạnh. Tuy nhiên, cũng có không ít đại biểu nhìn nhận hình thức này đã lỗi thời, bộc lộ nhiều hạn chế. Do vậy, vấn đề được quan tâm và bàn thảo nhiều nhất tại hội thảo là nên hay không nên có một kỳ thi tốt nghiệp THPT quốc gia, hay vẫn tổ chức thi tuyển sinh ĐH, CĐ bằng nhiều hình thức khác nhau. Tiến sĩ Nguyễn Đức Nghĩa cho rằng muốn thay đổi thì cần phải có lộ trình, thời gian và sự chuẩn bị. “Nếu bỏ “ba chung” ngay, hay chỉ tổ chức kỳ thi tốt nghiệp THPT quốc gia ngay thì học sinh sẽ loạn khi đăng ký, còn các trường sẽ loạn khi tranh giành học sinh”, ông Nghĩa nhấn mạnh. Hôm qua, Đại học Quốc gia TP Hồ Chí Minh đã tổ chức Hội thảo khoa học “Đổi mới tuyển sinh Đại học và Cao đẳng tại Việt Nam”, với sự tham dự của đông đảo các nhà khoa học, các nhà nghiên cứu về giáo dục đại học ở Việt Nam. Hội thảo đã nêu các kinh nghiệm về tuyển sinh ĐH, CĐ ở các nước có nền giáo dục đại học phát triển như: Hoa Kỳ, Nga, Hà Lan, Nhật Bản, Hàn Quốc,.. nhằm đưa ra những giải pháp khả thi cho công tác tuyển sinh ĐH, CĐ ở Việt Nam. Ngày 19-12, Đại học Quốc gia TP Hồ Chí Minh đã tổ chức Hội thảo khoa học “Đổi mới tuyển sinh Đại học và Cao đẳng tại Việt Nam”, với sự tham dự của đông đảo các nhà khoa học, các nhà nghiên cứu về giáo dục đại học ở Việt Nam. GS. TSKH Lâm Quang Thiệp cho rằng: tuyển sinh đại học là một khâu quan trọng trong hoạt động giáo dục của nhiều nước trên thế giới, vì nó tác động đến giới trẻ, là cái cổng dẫn đến con đường lập thân của giới trẻ, góp phần quyết định sự thành đạt trong tương lai của họ... Với Việt Nam, khi giáo dục đại học đang có xu hướng đại chúng hóa, tuyển sinh đại học (ĐH) và cao đẳng (CĐ) đang là mối quan tâm hàng đầu của toàn xã hội. Nọi dung có thể đọc ở bài 9! Có nên tổ chức kỳ thi chung xét tốt nghiệp THPT và tuyển sinh vào đại học? Thời điểm nào thực hiện? Bỏ thi tuyển sinh đại học liệu có ổn? Những câu hỏi này một lần nữa được các nhà giáo dục mang ra bàn bạc ở “Hội thảo đổi mới tuyển sinh đại học, cao đẳng tại Việt Nam” do Đại học Quốc gia TP.HCM tổ chức ngày 19/12. Không thể phủ nhận những mặt được của phương thức tuyển sinh “ba chung” được áp dụng từ năm 2002 nhưng phương thức này cũng có quá nhiều bất cập. Hầu hết ý kiến đồng tình việc chấm dứt phương thức tuyển sinh này. Tuy nhiên, ý kiến từ các trường đại học (ĐH) cũng chưa thống nhất phương án thi khác. Tiến sĩ Nguyễn Đức Nghĩa, phó giám đốc ĐHQG TP.HCM dự báo một viễn cảnh khi tổ chức kỳ thi “hai trong một” (lấy kết quả thi tốt nghiệp THPT xét tuyển vào ĐH, CĐ): thử tưởng tượng lúc không tổ chức thi ĐH nữa, các trường ĐH sẽ làm gì, hồ sơ chạy đi đâu, làm hồ sơ tuyển sinh ĐH như thế nào? Liệu có tránh khỏi tình trạng hỗn loạn khi hàng chục người chen lấn vào một trường ĐH để mua hồ sơ? Cùng quan điểm này, ông Mỵ Giang Sơn, trưởng phòng đào tạo Trường ĐH Sài Gòn, cho rằng nếu không còn kỳ thi tuyển sinh ĐH, CĐ sẽ có nhiều trường rất đông thí sinh, trong khi nhiều trường khác thưa vắng. Các trường CĐ có thể không có nguồn tuyển sinh. Tiến sĩ Nguyễn Tiến Dũng, trưởng phòng đào tạo Trường ĐH Sư phạm Kỹ thuật TP.HCM, cho rằng, tuyển sinh gắn liền với chuẩn đầu vào của từng trường, hãy để các trường được tự chủ chuyện này. Rất nhiều ý kiến không đồng tình việc lấy kết quả thi tốt nghiệp THPT để tuyển sinh vào ĐH. Nói như Phó Giáo sư, Tiến sĩ Nguyễn Văn Nhã, trưởng ban đào tạo ĐHQG Hà Nội, khâu tuyển sinh gắn liền với chiến lược phát triển của từng trường ĐH. Chất lượng đầu vào, đầu ra là một tiêu chí xác định vị thế, đẳng cấp của mỗi trường ĐH. Vì lẽ này, các trường ĐH kiến nghị: muốn thay đổi cách tổ chức thi ĐH phải có chính sách hợp lý và có lộ trình để đảm bảo công bằng và tuyển đúng những người cần cho từng nhóm ngành đào tạo của các trường. Lộ trình ấy như thế nào? Ngay chính những người làm công tác tuyển sinh ở các trường ĐH vẫn chưa thể hình dung được, chưa biết mình sẽ làm gì chuẩn bị cho kỳ thi chung ấy khi thời điểm sáp nhập đã gần kề (năm 2010). Nhiều ý kiến tại hội thảo hồ nghi tính khả thi đề án này: liệu có chắc chắn năm 2010 sẽ chỉ có một kỳ thi hay sẽ tiếp tục hoãn như từng hoãn nhiều lần trước đây? Hậu “ba chung” tuyển sinh theo kiểu gì? Tiến sĩ Vũ Thị Phương Anh (ĐHQG TP.HCM) đề xuất ba phương án tuyển sinh cho các nhóm trường khác nhau trong trường hợp không còn kỳ thi “ba chung”. Theo đề xuất này, Tiến sĩ Phương Anh chia các trường ra thành ba nhóm. Nhóm thứ nhất gồm các trường, ngành không đặc thù, không có tính cạnh tranh cao, không sử dụng kinh phí của Nhà nước. Nhóm này sử dụng kết quả thi tốt nghiệp THPT và xét học bạ. Nhóm thứ hai gồm các trường, ngành có tính đặc thù và cạnh tranh cao, đòi hỏi năng lực, năng khiếu đặc biệt của người học hoặc nhận được sự đầu tư đặc biệt của Nhà nước. Nhóm này sử dụng kết quả của kỳ thi tốt nghiệp THPT kết hợp với kết quả một kỳ thi khác. Xét tuyển hay thi tuyển? Tiến sĩ Nguyễn Đức Nghĩa cho rằng ở cấp độ từng trường cụ thể, lãnh đạo nhà trường nên xem xét để quyết định một số ngành xét tuyển hay thi tuyển. Những ngành khó tuyển hay không đặc thù thì nên tổ chức xét tuyển với những điều kiện, tiêu chí, chuẩn mực cụ thể. Những ngành có tính cạnh tranh cao thì nên tổ chức thi. Ở cấp độ mạng lưới trường, Bộ GD-ĐT cần có quy trình, lịch trình cụ thể tổ chức việc xét tuyển hợp lý. Nhóm thứ ba gồm các hệ đào tạo đặc biệt như hoàn thiện ĐH, tại chức, đào tạo từ xa, văn bằng 2… chỉ cần xét hồ sơ xin học kèm các yếu tố dân số. Phó Giáo sư, Tiến sĩ Nguyễn Văn Nhã đề xuất nhiều phương thức tuyển sinh khác nhau như: từ xét hồ sơ, phỏng vấn, thi vấn đáp, làm bài thi đến tổ chức thi nhiều vòng. Để phục vụ mục đích đó, các trường phải tạo điều kiện thuận tiện nhất cho thí sinh, đưa ra nhiều giải pháp khác nhau như tổ chức thi tuyển theo học kỳ, đăng ký dự thi qua mạng cùng những chính sách ưu tiên, ưu đãi hợp lý. Trong khi đó, Tiến sĩ Nguyễn Tiến Dũng cho rằng: “Giải pháp giảm áp lực thi cử không phải là nhập hai kỳ thi làm một mà phải chia thành nhiều kỳ thi, chia làm nhiều nơi tổ chức thi và bộ đừng bắt buộc các trường chỉ tuyển sinh một lần trong năm”. Dù còn nhiều ý kiến đồng tình duy trì kỳ thi tốt nghiệp THPT, dùng kết quả đó xét tuyển ĐH, nhưng cũng có nhiều ý kiến mạnh dạn đề xuất phương án ngược lại. Giáo sư, Tiến sĩ Khoa học Lâm Quang Thiệp cho rằng: phương án tổ chức một kỳ thi chung cuối bậc phổ thông là chủ trương đúng của Bộ. “Hai kỳ thi hiện nay tuy khác nhau nhưng đều giống nhau ở chỗ đánh giá năng lực học sinh qua chương trình phổ thông. “Tôi đề xuất phương án một kỳ thi cuối bậc phổ thông nhưng không phải là thi tốt nghiệp, không dùng kết quả này để xét tốt nghiệp. Đây cũng không phải là kỳ thi tuyển trực tiếp vào ĐH như hiện nay, mà là kỳ thi độc lập để đánh giá năng lực người học sau THPT. Kỳ thi này có thể tổ chức nhiều lần trong năm, người học có thể học bằng nhiều con đường khác nhau đều có thể tham dự kỳ thi này. Theo tôi, kỳ thi tốt nghiệp không cần thiết phải tổ chức thành kỳ thi quốc gia và để đảm bảo khách quan, kỳ thi chung không nên gắn với các địa phương” - ông nói. Còn Tiến sĩ Nguyễn Tiến Dũng mạnh dạn đề xuất: “Việc kiểm tra công nhận tốt nghiệp THPT có thể giao về cho các địa phương, Bộ chỉ cần công bố chuẩn tốt nghiệp, việc này phải có sự chuẩn bị, đến năm 2012 chẳng hạn. Nếu chúng ta lo ngại tiêu cực mà không dám đưa ra những chính sách mới, tức là có thể trói buộc những nơi không tiêu cực”. Ông Mỵ Giang Sơn cho rằng: “Học sinh hoàn thành chương trình THPT có thể được cấp bằng hoặc chứng nhận tốt nghiệp, không nhất thiết phải thi tốt nghiệp”. Nhiều ý kiến bên lề hội thảo cũng đặt vấn đề: thi tốt nghiệp quy mô quốc gia làm chi khi tỉ lệ đậu nhiều nơi đến 98% và chúng ta đang tiến tới phổ cập THPT? Vấn đề còn lại là chuyện tổ chức thi ĐH như thế nào cho hợp lý và công bằng. GS-TSKH Lâm Quang Thiệp: “Đòi hỏi một bằng chung, tiêu chuẩn quốc gia chung cho các tỉnh là ảo tưởng”. (Dân trí) - Tại Hội thảo về Đổi mới tuyển sinh ĐH, CĐ được tổ chức tại ĐHQG TPHCM ngày hôm qua, 19/12, nhiều đại biểu tham dự cho rằng: Tuyển sinh ĐH, CĐ là việc của các trường chứ không phải của Bộ GD-ĐT. Tuyển sinh ĐH, CĐ là một khâu quan trọng trong hoạt động giáo dục của nhiều nước trên thế giới, vì nó động chạm tới giới trẻ và gia đình của họ, nó là một cái cổng dẫn đến một con đường quan trọng để lập thân, lập nghiệp của giới trẻ, góp phần khá quyết định vào sự thành đạt của họ trong tương lai. Việc đổi mới tuyển sinh ĐH, CĐ tại Việt Nam vẫn là một “câu chuyện” được nhiều nhà nghiên cứu về giáo dục quan tâm. Năm 2007, nhằm đảm bảo công bằng, nghiêm túc, khách quan trong việc xét tuyển vào ĐH, CĐ đồng thời nâng cao hiệu quả công tác tuyển sinh, giảm áp lực và chi phí cho người học và xã hội, Bộ GD-ĐT đã đưa ra một đề án tổng thể về đổi mới công tác tuyển sinh. Theo đó, nhiều giải pháp đã được đề xuất. Một giải pháp được khá nhiều đồng tình là tổ chức thống nhất một kỳ thi quốc gia sau THPT, sử dụng hình thức trắc nghiệm khách quan (TNKQ) và ứng dụng CNTT trong quy trình tổ chức thi, và sử dụng kết quả của kỳ thi này làm một căn cứ quan trọng để xét tuyển vào ĐH, CĐ và TCCN. Và đây cũng là những biện pháp đã được áp dụng ở nhiều nước trên thế giới. Tuy nhiên, cho đến nay xung quanh đề án này vẫn còn những ý kiến khác nhau về tính hợp lý và khả thi của các biện pháp đã được đề xuất trong bối cảnh của Việt Nam, và những tác động tích cực cũng như tiêu cực có thể có của các biện pháp này lên hiệu quả của công tác tuyển sinh và chất lượng đầu vào của sinh viên. Nhiều đại biểu cho rằng, mục tiêu của kỳ thi tốt nghiệp THPT là để đánh giá trình độ người học, còn kỳ thi ĐH, CĐ là để đánh giá xem người học có đủ trình độ để học tiếp ở trường mà thí sinh đã lựa chọn hay không. Nếu trộn lẫn hai mục tiêu này vào một kỳ thi thì còn nhiều việc phải bàn. Các trường ĐH sẽ không tin vào kết quả của kỳ thi chung vì chắc chắn tiêu cực sẽ rất nhiều. Đồng tình với nhiều ý kiến trên, GS-TSKH Lâm Quang Thiệp (nguyên Vụ trưởng Vụ ĐH và sau ĐH) cũng cho rằng: “Phương án tổ chức một kỳ thi ở cuối bậc phổ thông của Bộ GD-ĐT là một chủ trương đúng đắn. Tuy nhiên, kỳ thi tốt nghiệp THPT không nên tổ chức thành kỳ thi quốc gia. Việc đòi hỏi một bằng chung, tiêu chuẩn quốc gia chung cho các tỉnh là ảo tưởng vì điều kiện kinh tế - xã hội của từng địa phương là khác nhau”. “Bỏ tuyển sinh thì sẽ loạn. Vả lại, đề thi của năm này so với năm kia không tương đương được với nhau. Nếu chúng ta tổ chức một kỳ thi và sử dụng kết quả này thì kết quả của năm nay có giống kết quả năm sau không? Học sinh dự thi năm nay có thể dùng kết quả để xét năm sau không?...” - TS. Nguyễn Đức Nghĩa, Phó giám đốc ĐHQG TPHCM băn khoăn. Qua đó, TS Nghĩa nêu lên một vấn đề: “Tuởng tượng kịch bản nếu không thi thì các trường ĐH, CĐ sẽ làm gì, Bộ làm gì, thí sinh như thế nào? Tôi không chủ trương bỏ thi tuyển sinh ngay, bỏ thi phải có cái gì đó để thi sinh biết được thí sinh nên làm gì. Chứ không sẽ diễn ra cảnh hàng ngàn thí sinh và phụ huynh chen lấn vào một trường nào đó để dự thi, còn những trường khác không có ai tới đăng ký!”. Đồng quan điểm, thầy Nguyễn Tiến Dũng, Trưởng phòng đào tạo ĐH Sư phạm Kỹ thuật TPHCM cho biết: “Nếu bỏ thi năm nay thì các trường sẽ chết. Chúng ta phải đa dạng hóa hình thức tuyển sinh. Công việc tuyển sinh là của các trường. Bộ không nên ôm khư khư mãi chuyện tuyển sinh, nên giao cho các trường tự xét tuyển cho riêng mình”. Ngoài ra, nhiều ý kiến cho rằng, đổi mới cần phải có lộ trình, không thể nói đã quyết là làm ngay được, chẳng khác nào chuyện “vừa đá bóng vừa thổi còi”. Kỳ thi này một năm nên tổ chức vài lần, thí sinh muốn thi lúc nào cũng được. Thi một lần như hiện nay thì rất áp lực và tạo nên những tiêu cực, chia địa điểm và thời kỳ thi thì sẽ giảm áp lực. - Bộ nên giao quyền tự chủ cho các trường trong tuyển sinh đại học - cao đẳng, để các trường có thể xây dựng phương án tuyển sinh phù hợp hơn. Đó là ý kiến của nhiều đại biểu tại buổi hội thảo “Đổi mới tuyển sinh ĐH – CĐ” diễn ra tại ĐHQG TP.HCM ngày 19/12. Đóng góp ý kiến về tuyển sinh đại học ở Việt Nam, Ths Đỗ Mạnh Cường, Viện nghiên cứu phát triển giáo dục thuộc ĐH Sư phạm TP.HCM, khẳng định: “Tuyển sinh là việc của các trường đại học, không phải việc của Bộ GD&ĐT. Bộ chỉ nên quản lý việc cấp học bổng, đảm bảo học bổng được cấp đúng đối tượng, công bằng và hiệu quả mà thôi”. Theo Ths Cường nếu làm được điều này thì sẽ dẫn đến việc bãi bỏ kỳ thi quốc gia như hiện nay và các trường được quyền tự quyết định phương thức tuyển sinh phù hợp. Về vấn đề này, PGS. TS Nguyễn Văn Trình – Phó trưởng Khoa Kinh tế (ĐHQG HCM) – đề nghị: “Chúng ta cần thực hiện kỳ thi tú tài cho tốt, và kết quả thi tú tài sẽ là cơ sở để các trường đại học tự xét tuyển theo tiêu chuẩn của từng trường. Cần quản lý đầu ra thật chặt, thí dụ: một giảng đường 10.000 SV nhưng khi tốt nghiệp chỉ còn 10 người. Trường nào dạy giỏi thì người học đến nhiều, trường dạy không tốt thì không ai học”. Tại buổi hội thảo, khá nhiều đại biểu tán thành quan điểm để các trường đại học, cao đẳng tự chủ trong tuyển sinh. TS Nguyễn Tiến Dũng, Trưởng phòng Đào tạo ĐH Sư phạm Kỹ thuật TP.HCM, nhấn mạnh: “Chúng ta phải đa dạng hóa hình thức tuyển sinh, mỗi năm được thi tuyển nhiều lần. Công việc tuyển sinh là của các trường. Nếu Bộ cứ ôm khư khư rồi tổ chức một năm chỉ một kỳ thi sẽ tạo ra áp lực không cần thiết. Bộ nên giao cho các trường quyền tự xét tuyển, tự có phương án tuyển sinh”. Phân tích về quan điểm này, PGS Nguyễn Thị Phương Nga, Giám đốc Trung tâm Đảm bảo chất lượng đào tạo và Nghiên cứu phát triển giáo dục (ĐHQG Hà Nội), nói: “Không nên dùng kỳ thi tốt nghiệp lớp 12 để tuyển chọn vào đại học. Vì các trường đại học đào tạo các ngành khác nhau theo từng năng khiếu, sở thích của học sinh”. PGS Nga đưa ra kiến nghị: “Việc tổ chức thi tốt nghiệp phổ thông nên để cho các địa phương làm, còn việc của các cấp quản lý vĩ mô là đưa ra tiêu chuẩn về chất lượng của đề thi. Còn thi đại học thì để các trường đại học tự chọn phương án tuyển sinh, và được tuyển sinh nhiều lần trong một năm. Học sinh có thể thi thử và có thể thi nhiều lần, không có sự căng thẳng”. TS Vũ Thị Phương Anh, Giám đốc Trung tâm Khảo thí và Đánh giá chất lượng đào tạo của ĐHQG HCM, cho rằng, các trường và các ngành đào tạo có các mục tiêu và yêu cầu khác nhau nên không thể có một phương án tuyển sinh tối ưu chung, mà cần thiết phải có sự phân biệt giữa các nhóm ngành, trường khác nhau. TS Nguyễn Mạnh Hùng, Hiệu trưởng ĐH Hồng Bàng, nói: “Tại sao chúng ta mãi lo tuyển sinh mà không quan tâm tới quá trình đào tạo? Trước đây, chúng ta không hề có tuyển sinh. Chúng ta nên sàng lọc trong quá trình đào tạo chứ không phải sàng lọc đầu vào. Chúng ta đang quan tâm tới đầu vào quá nhiều và tốn nhiều công sức”. Theo TS Hùng, hiện nay các trường được giao chỉ tiêu để đào tạo và việc này cũng là một loại hình tuyển sinh; nếu cứ giữ mãi hình thức thi tuyển như thế này thì hết sức tốn kém và căng thẳng. Cùng quan điểm này, PGS. TS Nguyễn Văn Trình đề xuất: “Theo tôi, nên chăng chúng ta bỏ thi đại học? Thay vào đó, chúng ta tập trung làm nghiêm túc, công bằng kỳ thi tú tài là được. Sau đó, các trường đại học, cao đẳng sẽ có phương án tuyển sinh cho riêng mình”. Khá nhiều đại biểu cũng đồng tình với phương án bỏ thi. Tuy nhiên, PGS – TS Nguyễn Đức Nghĩa – Phó giám đốc ĐHQGHCM cho rằng: “Nếu bỏ thi lúc này thì sẽ loạn!”. Ông Nghĩa nói: “Chúng ta thử hình dung nếu không thi nữa thì các trường sẽ làm gì, Bộ làm gì, thí sinh sẽ như thế nào? Tôi không chủ trương bỏ thi ngay. Ngay cả nếu bỏ thi thì chúng ta phải đưa ra một định hướng để thi sinh biết nên làm gì, để tránh xảy ra cảnh hàng ngàn thí sinh và phụ huynh chen lấn vào một trường nào đó để xét tuyển thi, còn những trường khác không có ai tới đăng ký”. Xét trên tình hình thực tế hiện nay, TS Vũ Thị Phương Anh cho rằng: “Nếu theo đề án đổi mới tuyển sinh của Bộ thì việc đưa ra các phương án tuyển sinh phù hợp với mục tiêu đào tạo của từng trường ngay bây giờ là vấn đề cấp thiết”. TS Phương Anh cũng giới thiệu 3 phương án tuyển sinh mới: Đối với những trường, ngành không đặc thù, không có tính cạnh tranh cao và không sử dụng kinh phí của Nhà nước thì có thể xét tuyển dựa kết quả thi tốt nghiệp THPT và học bạ. Còn các trường, ngành đặc thù, có tính cạnh tranh cao hoặc đòi hỏi năng lực, năng khiếu thì xét tuyển dựa vào kết quả thi tốt nghiệp và thêm một kỳ thi riêng. Đối với các hệ đào tạo đặc biệt (hoàn thiện đại học, văn bằng 2…) thì các trường có thể xét tuyển bằng hình thức ghi danh kèm theo các yêu cầu tối thiểu. Mặc dù còn nhiều vấn đề cần phải xem xét thêm, nhưng hầu hết các ý kiến đều thống nhất là ngành giáo dục nên có một lộ trình chuẩn bị cho kỳ thi chung. Đồng thời, các trường đại học phải được giao quyền để có phương án tuyển sinh phù hợp với sứ mệnh đào tạo của mình. TT - Có nên tổ chức kỳ thi chung xét tốt nghiệp THPT và tuyển sinh vào ĐH? Thời điểm nào thực hiện? Bỏ thi tuyển sinh ĐH liệu có ổn? Những câu hỏi này một lần nữa được các nhà giáo dục mang ra bàn bạc ở “Hội thảo đổi mới tuyển sinh ĐH, CĐ tại VN” do ĐH Quốc gia TP.HCM tổ chức ngày 19-12. Không thể phủ nhận những mặt được của phương thức tuyển sinh “ba chung” được áp dụng từ năm 2002 nhưng phương thức này cũng có quá nhiều bất cập, hầu hết ý kiến đồng tình việc chấm dứt phương thức tuyển sinh này. Tuy nhiên, ý kiến từ các trường ĐH cũng chưa thống nhất phương án thi khác. Trao đổi với Tuổi Trẻ, TS Nguyễn Đức Nghĩa cho rằng ở cấp độ từng trường cụ thể, lãnh đạo nhà trường nên xem xét để quyết định một số ngành xét tuyển hay thi tuyển. Những ngành khó tuyển hay không đặc thù thì nên tổ chức xét tuyển với những điều kiện, tiêu chí, chuẩn mực cụ thể. Những ngành có tính cạnh tranh cao thì nên tổ chức thi. Ở cấp độ mạng lưới trường, Bộ GD-ĐT cần có quy trình, lịch trình cụ thể tổ chức việc xét tuyển hợp lý. TS Nguyễn Đức Nghĩa, phó giám đốc ĐHQG TP.HCM, dự báo một viễn cảnh khi tổ chức kỳ thi “hai trong một” (lấy kết quả thi tốt nghiệp THPT xét tuyển vào ĐH, CĐ): thử tưởng tượng lúc không tổ chức thi ĐH nữa, các trường ĐH sẽ làm gì, HS chạy đi đâu, làm hồ sơ tuyển sinh ĐH như thế nào? Liệu có tránh khỏi tình trạng hỗn loạn khi hàng chục người chen lấn vào một trường ĐH để mua hồ sơ? Cùng quan điểm này, ông Mỵ Giang Sơn, trưởng phòng đào tạo Trường ĐH Sài Gòn, cho rằng nếu không còn kỳ thi tuyển sinh ĐH, CĐ sẽ có nhiều trường rất đông thí sinh, trong khi nhiều trường khác thưa vắng, các trường CĐ có thể không có nguồn tuyển sinh. TS Nguyễn Tiến Dũng, trưởng phòng đào tạo Trường ĐH Sư phạm Kỹ thuật TP.HCM, cho rằng tuyển sinh gắn liền với chuẩn đầu vào của từng trường, hãy để các trường được tự chủ chuyện này. Rất nhiều ý kiến không đồng tình việc lấy kết quả thi tốt nghiệp THPT để tuyển sinh vào ĐH. Nói như PGS-TS Nguyễn Văn Nhã, trưởng ban đào tạo ĐHQG Hà Nội, khâu tuyển sinh gắn liền với chiến lược phát triển của từng trường ĐH. Chất lượng đầu vào, đầu ra là một tiêu chí xác định vị thế, đẳng cấp của mỗi trường ĐH. Vì lẽ này, các trường ĐH kiến nghị: muốn thay đổi cách tổ chức thi ĐH phải có chính sách hợp lý và có lộ trình để đảm bảo công bằng và tuyển đúng những người cần cho từng nhóm ngành đào tạo của các trường. Lộ trình ấy như thế nào? Ngay chính những người làm công tác tuyển sinh ở các trường ĐH vẫn chưa thể hình dung được, chưa biết mình sẽ làm gì chuẩn bị cho kỳ thi chung ấy khi thời điểm sáp nhập đã gần kề (năm 2010). Nhiều ý kiến tại hội thảo hồ nghi tính khả thi đề án này: liệu có chắc chắn năm 2010 sẽ chỉ có một kỳ thi hay sẽ tiếp tục hoãn như từng hoãn nhiều lần trước đây? TS Vũ Thị Phương Anh (ĐHQG TP.HCM) đề xuất ba phương án tuyển sinh cho các nhóm trường khác nhau trong trường hợp không còn kỳ thi “ba chung”. Theo đề xuất này, TS Phương Anh chia các trường ra thành ba nhóm. Nhóm thứ nhất gồm các trường, ngành không đặc thù, không có tính cạnh tranh cao, không sử dụng kinh phí của Nhà nước. Nhóm này sử dụng kết quả thi tốt nghiệp THPT và xét học bạ. Nhóm thứ hai gồm các trường, ngành có tính đặc thù và cạnh tranh cao, đòi hỏi năng lực, năng khiếu đặc biệt của người học hoặc nhận được sự đầu tư đặc biệt của Nhà nước. Nhóm này sử dụng kết quả của kỳ thi tốt nghiệp THPT kết hợp với kết quả một kỳ thi khác. Nhóm thứ ba gồm các hệ đào tạo đặc biệt như hoàn thiện ĐH, tại chức, đào tạo từ xa, văn bằng 2… chỉ cần xét hồ sơ xin học kèm các yếu tố dân số. PGS-TS Nguyễn Văn Nhã đề xuất nhiều phương thức tuyển sinh khác nhau như: từ xét hồ sơ, phỏng vấn, thi vấn đáp, làm bài thi đến tổ chức thi nhiều vòng. Để phục vụ mục đích đó, các trường phải tạo điều kiện thuận tiện nhất cho thí sinh, đưa ra nhiều giải pháp khác nhau như tổ chức thi tuyển theo học kỳ, đăng ký dự thi qua mạng cùng những chính sách ưu tiên, ưu đãi hợp lý. Trong khi đó TS Nguyễn Tiến Dũng cho rằng: “Giải pháp giảm áp lực thi cử không phải là nhập hai kỳ thi làm một mà phải chia thành nhiều kỳ thi, chia làm nhiều nơi tổ chức thi và bộ đừng bắt buộc các trường chỉ tuyển sinh một lần trong năm”. GS - TSKH Lâm Quang Thiệp cho rằng: phương án tổ chức một kỳ thi chung cuối bậc phổ thông là chủ trương đúng của bộ. “Hai kỳ thi hiện nay tuy khác nhau nhưng đều giống nhau ở chỗ đánh giá năng lực HS qua chương trình phổ thông. “Tôi đề xuất phương án một kỳ thi cuối bậc phổ thông nhưng không phải là thi tốt nghiệp, không dùng kết quả này để xét tốt nghiệp. Đây cũng không phải là kỳ thi tuyển trực tiếp vào ĐH như hiện nay, mà là kỳ thi độc lập để đánh giá năng lực người học sau THPT. Kỳ thi này có thể tổ chức nhiều lần trong năm, người học có thể học bằng nhiều con đường khác nhau đều có thể tham dự kỳ thi này. Theo tôi, kỳ thi tốt nghiệp không cần thiết phải tổ chức thành kỳ thi quốc gia và để đảm bảo khách quan, kỳ thi chung không nên gắn với các địa phương” - ông nói. Còn TS Nguyễn Tiến Dũng mạnh dạn đề xuất: “Việc kiểm tra công nhận tốt nghiệp THPT có thể giao về cho các địa phương, bộ chỉ cần công bố chuẩn tốt nghiệp, việc này phải có sự chuẩn bị, đến năm 2012 chẳng hạn. Nếu chúng ta lo ngại tiêu cực mà không dám đưa ra những chính sách mới, tức là có thể trói buộc những nơi không tiêu cực”. Ông Mỵ Giang Sơn cho rằng: “HS hoàn thành chương trình THPT có thể được cấp bằng hoặc chứng nhận tốt nghiệp, không nhất thiết phải thi tốt nghiệp”. Cải tiến tuyển sinh: Nên phân cấp, phân quyền! Đúng nửa tháng trước hội nghị tuyển sinh ĐH-CĐ 2009, ngày 19.12, ĐH Quốc gia TP.HCM đã tổ chức hội thảo “Đổi mới tuyển sinh ĐH-CĐ tại VN”. Nhiều đại biểu đã đặt nhiều vấn đề băn khoăn trước những thông tin chưa rõ ràng về kỳ thi tốt nghiệp THPT và sử dụng kết quả đó để xét tuyển ĐH. PGS-TS Nguyễn Văn Nhã – Trưởng ban Đào tạo, ĐHQG Hà Nội - phát biểu thẳng: “ĐHQG Hà Nội chưa tin việc dùng kết quả thi tốt nghiệp THPT để làm căn cứ quan trọng trong việc xét tuyển ĐH-CĐ”. Về lộ trình đổi mới tuyển sinh mà Bộ GD-ĐT đưa ra, cảm giác mơ hồ hiện rõ trong hội thảo khi nhiều đại biểu nói với nhau: “Chắc gì đến 2010 sẽ tổ chức được một kỳ thi tốt nghiệp THPT quốc gia như dự định, để lấy kết quả xét tuyển vào ĐH?”. TS Nguyễn Chí Hòa – Giám đốc Trung tâm Khảo thí trường ĐH Khoa học Xã hội và Nhân văn (ĐHQG HN) nói: “Hạn chế của Bộ GD-ĐT trong thời gian vừa rồi là chưa chuẩn bị đầy đủ kế hoạch đổi mới tuyển sinh mà đã tung hết lên báo chí, tạo cho dư luận xôn xao vì không biết sắp tới sẽ thi kiểu gì?”. TS Nguyễn Thị Tuyết – Phó ban Công tác sinh viên ĐHQG Hà Nội nhận xét, áp lực duy nhất cho thí sinh thi vào ĐH là chỉ có 1 kỳ thi/năm, tất cả học sinh tốt nghiệp THPT chịu áp lực quá lớn khi phải vượt qua kỳ thi này, mỗi năm mới tổ chức 1 lần thì quá ít. Cho đến nay Bộ GD-ĐT chưa cho biết rõ bao giờ thì tổ chức kỳ thi duy nhất cuối bậc phổ thông để xét vào ĐH, kỳ thi đó được tổ chức như thế nào, bao nhiêu môn thi sẽ dùng đề trắc nghiệm. GS Lâm Quang Thiệp đề nghị nên học tập cách tuyển sinh ở Mỹ. Chúng ta, nếu chưa tư nhân hóa được thì cũng nên phi tập trung hóa, nghĩa là không phải mọi thứ đều tập trung do Bộ GD-ĐT làm. Nên giao thêm quyền cho 2 ĐHQG và các trường ĐH có uy tín tham gia điều hành tuyển sinh thì hiệu quả sẽ cao hơn nhiều. Ông nhận xét: “Cục Khảo thí ĐBCLGD thành lập đã 5 năm nhưng chưa làm được những việc cơ bản về đổi mới tuyển sinh. Để tổ chức kỳ thi quốc gia duy nhất có hiệu quả, cơ quan này nên nghiên cứu nghiêm túc các ý kiến đóng góp của các nhà khoa học có hiểu biết. Đồng thời, nên tìm sự hỗ trợ của các chuyên gia về khoa học đo lường trong giáo dục ở nước ta, của các chuyên gia giỏi từ nước ngoài”. Ông cũng đề nghị các ĐHQG phối hợp với các trường ĐH hàng đầu khác và các công ty trắc nghiệm chuyên nghiệp tổ chức thêm một kỳ thi với đề thi khó hơn, các câu hỏi trắc nghiệm đa dạng hơn và đánh giá các cấp độ tư duy cao hơn, có thể phối hợp trắc nghiệm và tự luận, để lấy kết quả xét tuyển vào các trường ĐH hàng đầu. TS Nguyễn Tiến Dũng – Trưởng phòng Đào tạo trường ĐH Sư phạm kỹ thuật TP.HCM – cho rằng nên giải tỏa áp lực kỳ thi: chia địa điểm thi theo từng cụm, từng vùng địa phương thống nhất với nhau, mỗi năm tổ chức thi ĐH vài lần, giao quyền nhiều hơn cho các vùng miền. Ông Dũng nói: “Bộ GD-ĐT nên xem tuyển sinh ĐH là một khâu trong quá trình đào tạo, nên giao cho các trường được tự chủ hơn trong tuyển sinh ĐH”. Với tư cách “chủ nhà” tổ chức hội thảo, TS Nguyễn Đức Nghĩa – Phó giám đốc ĐHQG TP.HCM nêu ra những điểm được nhiều đại biểu đồng ý như: mong muốn có một kỳ thi nhẹ nhàng hơn, chính xác và công bằng; cần có lộ trình, thời gian và sự chuẩn bị cần thiết; nên có cả phương thức thi kết hợp với xét tuyển. 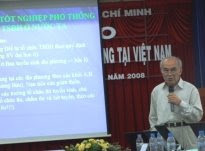 Riêng đối với ĐHQG TP.HCM, nếu đến năm 2010 bắt đầu cải tiến tuyển sinh như Bộ GD-ĐT dự định, các trường thành viên của ĐHQG - TP.HCM sẽ trình phương án vào giữa năm 2009 để khoảng tháng 9.2009 bắt đầu thực hiện. ĐHQG-TP.HCM cũng sẽ liên kết chặt chẽ với ĐHQG Hà Nội, mong muốn các trường ĐH khác cùng tham gia để giao lưu, học hỏi lẫn nhau. Các đại biểu dự hội thảo cũng thống nhất đề nghị khâu tuyển sinh nên để cho các trường chủ động, kể cả định mức điểm sàn; Bộ GD-ĐT chỉ lo vấn đề điều phối, đặt ra những vấn đề chung mang tính chất khung. Tuyển sinh ĐH-CĐ: Giải pháp nào cho hậu “3 chung”? “Phải bỏ thi tuyển “3 chung” thay bằng hình thức xét tuyển dựa vào kết quả kỳ thi tốt nghiệp THPT” là nội dung nóng bỏng được nhiều đại biểu đồng tình và đưa ra tranh luận sôi nổi tại hội thảo “Đổi mới tuyển sinh ĐH-CĐ” được tổ chức tại ĐH Quốc gia TPHCM ngày 19-12. Xung quanh vấn đề chấm dứt hình thức thi tuyển sinh “3 chung” vào năm 2010, nhiều đại biểu tỏ ra không tin tưởng vào những thông báo của Bộ GD-ĐT. PGS-TS Nguyễn Kim Hồng, Phó Hiệu trưởng Trường ĐH Sư phạm TPHCM, thẳng thắn cho rằng: Bản thân bộ cũng đang mâu thuẫn với chính mình trong việc xác định có hay không tổ chức một kỳ thi tốt nghiệp (TN) THPT quốc gia và dùng kết quả đó để xét tuyển vào ĐH-CĐ. Bây giờ không ai dám chắc thông báo đó có tiếp tục dời sang những năm kế tiếp hay không. Thực tế cho thấy, tình trạng thay đổi kế hoạch liên tục trước và sau mỗi kỳ thi tuyển sinh là điều mà thời gian qua xã hội lẫn các trường rất bức xúc. PGS-TS Nguyễn Chí Hòa, Giám đốc Trung tâm Đảm bảo chất lượng Trường ĐH KHXH-NV (ĐH QG Hà Nội) đặt nghi vấn: “Cho đến thời điểm này, dù trả lời trên các phương tiện thông tin đại chúng về đổi mới, cải tiến tuyển sinh nhưng các trường vẫn chưa thấy được sáng kiến nào của bộ. Có chăng chỉ là những sáng kiến, ý tưởng chưa đâu vào đâu đã vội vàng thông báo... rồi rút lại. Các trường và học sinh không thể đoán trước được sẽ học và thi kiểu gì? Trong khi đó, Trung tâm Khảo thí - Kiểm định chất lượng Bộ GD-ĐT ra đời đã 5 năm rồi nhưng vẫn chưa thấy có một đóng góp gì cho đổi mới công tác tuyển sinh”. TS Nguyễn Tiến Dũng, Trưởng phòng Đào tạo Trường ĐH Sư phạm Kỹ thuật TPHCM, nhấn mạnh, từ năm 2002 đến nay bộ ôm đồm hết nên các trường hoàn toàn bị động, không thể tự chủ được trong tuyển sinh. Do đó, kiến nghị “nên để các trường tự chủ trong tuyển sinh, bộ chỉ lo quản lý, theo dõi, đánh giá”, đã được nhiều đại biểu đồng tình. Hiện nay các trường đều đã lên phương án cho công tác tuyển sinh hậu “3 chung” và sẽ gửi kiến nghị trình Bộ GD-ĐT. Tuy nhiên, điều mà nhiều đại biểu quan tâm là khi nào bộ sẽ chính thức công khai, minh bạch lộ trình bỏ thi “3 chung” cũng như các quy định, chính sách đổi mới để các trường mạnh dạn xét tuyển, tránh tình trạng cứ tới mỗi mùa tuyển sinh lại phải đối phó với bao rối rắm. Xét tuyển có tối ưu? Vấn đề quan tâm tại hội thảo là “nên có một kỳ thi tốt nghiệp THPT quốc gia để xét tuyển hay vẫn tổ chức thi tuyển sinh ĐH-CĐ bằng nhiều hình thức khác nhau”. GS-TSKH Lâm Quang Thiệp, nguyên Vụ trưởng Vụ ĐH, nêu rõ: đến năm 2009, nền giáo dục nước ta sẽ hội nhập sâu với thế giới và nhiều trường quốc tế sẽ có mặt tại VN. Nếu không bỏ “3 chung” thì chúng ta sẽ tụt hậu và tự thua ngay trên sân nhà. Do đó, phương án xét tuyển dựa trên kết quả thi tốt nghiệp THPT là hợp lý. Tuy nhiên, cũng có đại biểu quan ngại, các trường công lập hay các trường có chất lượng cũng thận trọng hơn khi cho rằng nếu làm không tốt thì chất lượng kỳ thi tốt nghiệp THPT toàn quốc sẽ có nhiều tiêu cực. Thậm chí không loại trừ tình trạng “gửi gắm”. Nói về phương pháp xét tuyển, TS Vũ Thị Phương Anh, Giám đốc Trung tâm Kiểm định chất lượng ĐHQG TPHCM, thận trọng: Do các trường và các ngành đào tạo có mục tiêu, yêu cầu khác nhau nên không thể có một phương án tuyển sinh chung cho tất cả TS. Nên chăng phải có phân biệt giữa các nhóm trường, nhóm ngành khác nhau. Đối với các trường hoặc ngành không đặc thù, không có tính cạnh tranh cao, không sử dụng kinh phí nhà nước, nên sử dụng kết quả thi tốt nghiệp THPT và xét học bạ. Ngược lại, đối với các trường, ngành đặc thù, có tính cạnh tranh cao, có sự đầu tư đặc biệt của nhà nước, ngoài sử dụng kết quả tốt nghiệp THPT, cần có một kỳ thi khác do các trường tự ra đề. Việc bỏ hay không kỳ thi tuyển sinh đại học còn có nhiều ý kiến khác nhau. Trong ảnh: Phụ huynh cùng các thí sinh nghỉ ngơi sau giờ thi tại Hội đồng thi trường Nguyễn Thị Minh Khai năm 2008. Ảnh: HTDBộ GD&ĐT không nên “ôm khư khư” kỳ thi tuyển sinh mà hãy để các trường tự lo liệu. Khi nào bỏ hẳn kỳ thi tuyển sinh đại học? Nên hay không nên tổ chức một kỳ thi tốt nghiệp THPT quốc gia? Giải pháp nào để có một kỳ thi hoàn hảo, đỡ căng thẳng, tốn kém? Hôm qua (19-12), lại một lần nữa những vấn đề nóng bỏng “Đổi mới kỳ thi tuyển sinh ĐH Việt Nam” được nhiều chuyên gia giáo dục ĐH trong cả nước đưa ra bàn luận tại hội thảo khoa học do hai ĐH Quốc gia Hà Nội và TP.HCM tổ chức. Thi đại học: Người bỏ, người không! Tiến sĩ Nguyễn Mạnh Hùng, Hiệu trưởng Đại học Hồng Bàng, nêu ý kiến: “Chúng ta quan tâm quá nhiều đến đầu vào, tốn công sức quá nhiều cho vấn đề này. Đề nghị bãi bỏ kỳ thi tuyển sinh ĐH, cương quyết đừng bàn cãi đến nó nữa!”. Theo ông Hùng, sắp tới đây, trong tiến trình hội nhập quốc tế, các nước sẽ đưa dịch vụ giáo dục vào Việt Nam mạnh mẽ hơn. Các trường ĐH Việt Nam cần nhanh chóng thay đổi cách tuyển sinh đầu vào mới theo kịp các trường nước ngoài. Đồng quan điểm với ý kiến của ông Nguyễn Mạnh Hùng, ông Nguyễn Quang Trình, Phó Trưởng khoa Kinh tế ĐH Quốc gia TP.HCM, cũng cho rằng không nên tồn tại kỳ thi tuyển sinh ĐH mà chỉ cần áp dụng một kỳ thi tốt nghiệp THPT chung cho cả nước. Ông Trình nêu thực tế trước 1975, các trường ĐH không tổ chức kỳ thi tuyển ĐH. Hàng ngàn thí sinh ghi danh học nhưng sau kỳ sát hạch chỉ còn khoảng trăm người theo học. Đó là cách tuyển sinh đầu vào và đào tạo khoa học mà không tốn kém, rầm rộ như hiện nay. Ngược với những quan điểm bỏ hẳn kỳ thi ĐH, tiến sĩ Nguyễn Đức Nghĩa - Phó Giám đốc ĐH Quốc gia TP.HCM đặt vấn đề: “Trong điều kiện hiện nay, tỷ lệ sinh viên/một vạn dân của Việt Nam vẫn còn thấp, không thể kìm hãm được nhu cầu học tập đang ngày càng tăng cao của người dân. Tuy nhiên, giáo dục ĐH cũng đang bộc lộ nhiều bất cập. Hãy tưởng tượng một kịch bản năm nay không tổ chức kỳ thi ĐH, hàng vạn thí sinh phải chạy vào đâu để tìm chỗ học? Có phải thí sinh cầm hồ sơ xét tuyển chen chúc nhau trước cổng trường, lúc đó ai giải quyết? Ai đủ sức dẹp loạn này?”. Trong khi đó, giáo sư Lâm Quang Thiệp lo ngại rằng: “Nếu lấy kết quả học bạ THPT làm cơ sở xét tuyển vào ĐH, chắc rằng các địa phương sẽ nhanh chóng đưa tỷ lệ thí sinh giỏi lên rất cao! Vì vậy, tổ chức một kỳ thi THPT chung không nên gắn với các địa phương, không để các địa phương tổ chức, kết quả sẽ khách quan hơn”. Tiến sĩ Nguyễn Tiến Dũng - Trưởng phòng Đào tạo Trường ĐH Sư phạm kỹ thuật TP.HCM cho rằng kỳ thi tuyển sinh ĐH phải được đa dạng hóa. Tại sao chúng ta cứ phải tổ chức một kỳ thi THPT rồi một kỳ thi ĐH để rồi tự tạo ra áp lực ngay chính những kỳ thi này. Vì vậy, ông Dũng đề nghị Bộ GD&ĐT không nên “ôm khư khư” kỳ thi tuyển sinh mà hãy để cho “người nông dân nghĩ trên luống cày của mình”, để cho các trường tự lo liệu. Cũng theo ông Dũng, việc cải tiến kỳ thi tuyển sinh cần có lộ trình công bố rõ ràng, chẳng hạn ít nhất là đến năm 2012 mới có tổ chức kỳ thi lấy kết quả chung xét tuyển vào ĐH. Việc nghiên cứu các bộ đề thi do hai ĐH Quốc gia Hà Nội và TP.HCM thực hiện. Từ đó, một năm có thể tổ chức thi vào nhiều lần, như vậy sẽ không còn tạo ra áp lực căng thẳng như kỳ thi hiện nay. Do các trường và các ngành đào tạo mục tiêu và yêu cầu khác nhau nên không thể có một phương án tuyển sinh tối ưu áp dụng chung cho tất cả các trường, các đối tượng thí sinh. Vì vậy, cần có sự phân biệt giữa các nhóm ngành, nhóm trường ĐH trong khâu tuyển sinh. Trên cơ sở này, tiến sĩ Vũ Thị Phương Anh - Giám đốc Trung tâm Khảo thí và giám định chất lượng đào tạo thuộc ĐH Quốc gia TP.HCM đề xuất các phương án tuyển sinh sau năm 2009. Cụ thể nhóm các trường không có tính cạnh tranh cao trong kỳ thi là những trường ĐH tư thục, dân lập, trung cấp chuyên nghiệp, CĐ công lập nên áp dụng hình thức xét tuyển. Trong khi đó, nhóm các trường có tính cạnh tranh cao trong thi tuyển sinh là các trường ĐH công lập, đặc biệt các trường trọng điểm với các chương trình đào tạo tiên tiến, cử nhân tài năng, chương trình đào tạo chất lượng cao... thì ngoài việc xét tuyển chung kết quả THPT còn có một kỳ thi đầu vào riêng theo yêu cầu của từng trường. Đây là nhóm ngành học đặc thù, đòi hỏi thí sinh phải có năng lực để thành công nên nhất thiết mức điểm đạt được tối thiểu phải được công bố trước để thí sinh biết và tự lượng sức mình. Và nhóm thứ ba là các hệ đào tạo đặc biệt gồm tại chức, đào tạo từ xa, văn bằng hai... Đây là đối tượng đã hoàn toàn trưởng thành, có kinh nghiệm làm việc nên xét tuyển từ hồ sơ xin học của người học. Khá nhiều đại biểu đến từ các trường ĐH đã bày tỏ nỗi lo ngại về tính chính xác, công bằng trong việc chọn lựa thí sinh vào ĐH theo hình thức xét tuyển dựa trên kết quả của kỳ thi tốt nghiệp THPT tại hội thảo Đổi mới tuyển sinh ĐH, CĐ tại VN, do ĐH Quốc gia TPHCM tổ chức ngày 19-12. Theo PGS-TS Nguyễn Phương Nga, ĐH Quốc gia Hà Nội, kỳ thi tốt nghiệp THPT chỉ mang tính chất kiểm tra kiến thức tối thiểu nên lấy kết quả này để làm căn cứ xét tuyển vào ĐH sẽ không kiểm chứng được năng lực thực sự của thí sinh. Còn TS Đồng Thị Tuyết Hạnh, Trung tâm Kiểm định và đánh giá chất lượng, ĐH Quốc gia TPHCM, bày tỏ băn khoăn: “Việc gộp chung hai kỳ thi có mục đích khác nhau liệu có bảo đảm được tính chính xác trong tuyển chọn và chất lượng “đầu vào” của các trường ĐH, CĐ sẽ ra sao?”. Theo đại biểu này, nếu tổ chức kỳ thi THPT quốc gia, lấy kết quả đó để xét tuyển vào ĐH, CĐ thì các trường vẫn phải tổ chức một kỳ xét tuyển riêng để chọn những thí sinh có đủ điều kiện và phù hợp với mục tiêu đào tạo của trường. Trong lúc đó, GS-TS Lâm Quang Thiệp, nguyên vụ trưởng Vụ ĐH, Bộ GD-ĐT, lo ngại: “Nếu lấy kết quả học tập THPT làm căn cứ xét tuyển vào ĐH thì học bạ của nhiều học sinh sẽ bị “biến hóa”. Do đó, theo GS-TS Lâm Quang Thiệp, nên tổ chức nhiều kỳ thi cho các học sinh cuối bậc phổ thông để sàng lọc dần và chọn được những thí sinh có năng lực thực sự vào giảng đường ĐH. Nhiều đại biểu cho rằng việc thí sinh sau khi tốt nghiệp THPT rồi lại đổ dồn lên TP dự thi ĐH như hiện nay gây lãng phí không nhỏ về thời gian, kinh phí cho thí sinh, người nhà thí sinh, cho các trường ĐH cũng như toàn xã hội. Do vậy, nhiều đại biểu đề nghị bộ không nên trì hoãn việc bỏ kỳ thi tuyển sinh ĐH. “Bộ không thể ôm mãi việc tuyển sinh mà nên giao cho các trường. Đa dạng hóa hình thức tuyển sinh là một khâu của quá trình tự chủ” - TS Nguyễn Tiến Dũng, Trưởng Phòng Đào tạo ĐH và Sau ĐH Trường ĐH Sư phạm Kỹ thuật TPHCM, nói. Tuy nhiên, việc tổ chức một kỳ thi tốt nghiệp THPT quốc gia thế nào để bảo đảm tính chính xác là điều nhiều đại biểu còn băn khoăn. “Nếu giao cho các tỉnh tổ chức kỳ thi này thì việc bảo đảm điều kiện chất lượng phụ thuộc vào trình độ và trách nhiệm của các tỉnh” - TS Nguyễn Hội Nghĩa, Trưởng Ban ĐH và Sau ĐH, ĐH Quốc gia TPHCM, nói. Còn TS Nguyễn Kim Hồng, Phó hiệu trưởng Trường ĐH Sư phạm TPHCM, nêu giải pháp: Các trường ĐH căn cứ hồ sơ xét tuyển (học bạ, các môn thi tốt nghiệp THPT) sơ tuyển những thí sinh đáp ứng yêu cầu tuyển sinh. Chỉ những ứng viên đáp ứng được những nhu cầu về hồ sơ mới được phỏng vấn hoặc dự kỳ thi của trường ĐH. “Các trường ĐH sẽ tự quyết định hình thức thi hay xét tuyển nhằm chọn đúng những thí sinh có năng lực để đạt được những kết quả mong đợi sau đào tạo”- TS Nguyễn Kim Hồng nói. Các đại biểu cũng cho rằng cần phải có lộ trình chứ không thể ngay lập tức bỏ kỳ thi ĐH. “Với tư cách là nhà quản lý, tôi phải cẩn trọng hơn và không dám bỏ ngay lập tức kỳ tuyển sinh ĐH mà cần có sự cải tiến như thế nào đó cho xã hội yên tâm hơn” - TS Nguyễn Đức Nghĩa, Phó Giám đốc ĐH Quốc gia TPHCM, cho biết. Một số đại biểu cho rằng nếu bỏ kỳ thi tuyển sinh ĐH đột ngột sẽ gây ra rối loạn rất lớn. “Hàng chục ngàn người sẽ chen nhau nộp đơn vào các trường ĐH có tiếng, còn những trường khác lại phải đối mặt với việc không có thí sinh” - TS Nguyễn Đức Nghĩa hình dung ra “kịch bản” về việc bỏ thi tuyển sinh ĐH. PGS-TS Nguyễn Phương Nga cũng đề nghị cần phải có thời gian trước khi quyết định bỏ kỳ thi này để có sự chuẩn bị kỹ lưỡng, tránh những rủi ro. Theo Đề án đổi mới tuyển sinh đại học, cao đẳng (TSĐH, CĐ) của Bộ Giáo dục - Đào tạo, sau kỳ thi tuyển sinh ĐH lần cuối cùng vào năm 2009, sẽ chỉ còn một kỳ thi THPT quốc gia mà kết quả sẽ được dùng để xét tốt nghiệp phổ thông và là căn cứ để xét tuyển vào ĐH, CĐ. Bộ GD-ĐT đã đề nghị các đơn vị đào tạo ĐH, CĐ trong cả nước đóng góp ý kiến đề án này. Sáng nay, 19-12, ĐHQG TPHCM đã có cuộc hội thảo “Đổi mới tuyển sinh ĐH, CĐ” với nhiều ý kiến xoay quanh vấn đề này. GS.TSKH Lâm Quang Thiệp, nguyên Vụ trưởng Vụ Đào tạo đại học, đã đưa ra kinh nghiệm tuyển sinh từ Hoa Kỳ và CHLB Nga. Theo đó, tại Hoa Kỳ, hệ thống TSĐH được thực hiện thông qua hai dịch vụ đánh giá phục vụ TSĐH là SAT và ACT. Sau đó các trường ĐH dựa vào kết quả thi của thí sinh ở hai hệ thống này để TSĐH. Còn tại CHLB Nga, kỳ thi quốc gia duy nhất được tổ chức nhằm đánh giá HS đủ trình độ tốt nghiệp chương trình phổ thông 11 năm, sau đó các trường ĐH có nhu cầu đặc biệt về HS có năng khiếu hoặc thể lực có thể tổ chức thi tuyển riêng. GS Lâm Quang Thiệp tỏ ra ủng hộ phương pháp thi trắc nghiệm khách quan cho một kỳ thi đại trà vì có thể đánh giá được năng lực của HS, đồng thời tránh áp đặt đánh giá chủ quan của người chấm thi, hạn chế được quay cóp, mang “phao”. GS ủng hộ đề án tổ chức một kỳ thi của bộ nhưng đó phải là kỳ thi độc lập để đánh giá năng lực người học ở cuối bậc phổ thông. TS. Vũ Thị Phương Anh (Giám đốc Trung tâm Khảo thí - Đánh giá chất lượng đào tạo ĐHQG TPHCM) cũng ủng hộ phương án tổ chức một kỳ thi, sử dụng kết quả đó để làm căn cứ xét tuyển. Nhưng với Việt Nam, bà cho rằng nên có 3 phương án tuyển sinh dựa vào các nhóm yếu tố được các nước trên thế giới xem xét khi tuyển sinh. Đó là dựa vào kết quả các kỳ thi THPT, rồi các trường tự tổ chức kỳ thi TS hoặc kỳ thi chuẩn hóa, phương pháp này được áp dụng nhiều ở các nước châu Âu và Bắc Mỹ. Từ đó, ở Việt Nam có thể có 3 phương án tuyển sinh như sau: Các trường/ngành không đặc thù, không có tính cạnh tranh cao hoặc không sử dụng kinh phí của nhà nước thì sử dụng kết quả thi tốt nghiệp THPT và xét học ba; các trường/ngành đặc thù, có tính cạnh tranh cao hoặc đòi hỏi năng lực, năng khiếu đặc biệt của người học thì sử dụng kết quả kỳ thi tốt nghiệp THPT và kết quả của một kỳ thi khác theo yêu cầu hoặc kỳ thi đầu vào do chính trường tổ chức; các hệ đào tạo đặc biệt (hoàn thiện ĐH, tại chức, đào tạo từ xa, văn bằng 2) thì xét hồ sơ xin học kèm theo yếu tố dân số, cần kiểm tra thường xuyên trong quá trình học theo nguyên tắc mở rộng đầu vào, thắt chặt đầu ra. Cô Đồng Thị Tuyết Hạnh, ĐHQG TPHCM, băn khoăn: “Nếu tổ chức một kỳ thi TN THPT quốc gia thì đề thi chung sẽ được soạn thảo và đảm bảo như thế nào? Làm sao phân định được hai mục đích rõ ràng của kỳ thi trong một đề thi? Ai sẽ là người kiểm chứng rằng đề thi có thể xác định chính xác trình độ và phân loại được HS để vừa công nhận TN vừa xét tuyển vào ĐH, CĐ”? Theo cô, không nên bỏ kỳ thi nào trong hai kỳ thi TN THPT và TSĐH vì mỗi kỳ thi có mỗi đặc thù và sàng lọc HS theo tiêu chí riêng. PGS. TS. Nguyễn Văn Nhã (Trưởng ban Đào tạo- ĐHQG Hà Nội) nêu quan điểm mỗi trường tùy theo nhu cầu mà có cách tuyển sinh riêng như xét tuyển hồ sơ, phỏng vấn trực tiếp, thi viết hoặc kiểm tra trình độ, năng lực, trắc nghiệm khách quan chứ không nên lấy một chuẩn chung nào cho việc TSĐH trên toàn quốc. Mục tiêu của kỳ thi TN THPT là nhằm đánh giá kiến thức của HS sau 12 năm, còn TSĐH, CĐ lại nhằm mục tiêu chọn người có đủ trình độ, kỹ năng để theo học chương trình của trường ĐH, CĐ mà họ đăng ký học. Thời thế tạo anh hùng thì cũng thời thế, cơ chế tạo ra phẩm chất người trí thức. Nói rõ hơn là hoàn cảnh chính trị xã hội, là bản lĩnh, tài năng các nhà lãnh đạo quốc gia, và một phần chính yếu, là môi trường giáo dục đương thời. Cho nên tôi rất tán thành hãy bắt đầu bằng vấn đề giáo dục để bàn chuyện xây dựng lớp trí thức mới. Sau nhiều năm Phần Lan nổi lên với những thành tựu kinh tế, khoa học, công nghệ làm cả thế giới khâm phục, người ta phát hiện ra cái gốc của sự thịnh vượng ấy là giáo dục. Ba phần tư thế kỷ qua, nước Mỹ đã chiếm vị trí số một trên hầu hết mọi lĩnh vực khoa học, công nghệ then chốt. Nếu nói trí thức là nói tài năng thì không đâu tài năng nở rộ nhiều như ở Mỹ. Nhiều người chúng ta bất bình, phẫn nộ chính đáng với một số chính sách nước lớn có khi quá tàn bạo của giới cầm quyền Mỹ, song vẫn chưa bao giờ hết ngưỡng mộ trí tuệ và tài năng của trí thức Mỹ mà những mầm mống thịnh vượng đã nảy nở từ những đại học đầu tiên khi Mỹ mới lập quốc. Đọc thư của Tổng thống Pháp gửi các nhà giáo Pháp, đọc bài diễn văn nhậm chức của bà Chủ Tịch ĐH Harvard, càng thấy rõ vấn đề trí thức nói cho cùng là vấn đề giáo dục. Nước Pháp muốn khôi phục truyền thống văn hóa rạng rỡ của mình từ Thế kỷ Ánh sáng, nước Mỹ muốn tiếp tục dẫn đầu trong thế kỷ văn minh trí tuệ, đều thấy cần dựa vào trụ cột giáo dục. Mà trong giáo dục thì quan trọng trước hết là tư duy cơ bản về giáo dục, tức là triết lý giáo dục, đương lối giáo dục. Khi góp ý kiến về chính sách trí thức cách đây không lâu tôi có đề nghị không nên đi sâu phân tích các yếu kém khuyết điểm của trí thức đang làm hạn chế sự đóng góp của họ vào công cuộc chấn hưng đất nước, mà nên suy nghĩ xem vì đâu dân tộc VN vốn thông minh không kém nhiều dân tộc khác, mà chí khí kiên cường càng không nhường ai, lại chưa có được một tầng lớp trí thức xứng đáng với dân tộc? Nhìn lại lịch sử hình thành lớp trí thức VN qua các thế hệ, tôi vẫn băn khoăn một câu hỏi lớn: tại sao trong hơn 80 năm qua, hình như chưa có thế hệ trí thức nào vượt qua được về tài năng, trí tuệ và cả phẩm chất nhân cách, thế hệ trí thức những năm 30-45 thế kỷ trước– thời kỳ Tự lực Văn đoàn, trào lưu Thơ mới, có các nhạc sĩ Văn Cao, Đặng Thế Phong, có các nhà khoa học, giáo dục hiện đại Đặng Thai Mai, Hoàng Xuân Hãn, Tạ Quang Bửu, Lê Văn Thiêm, Tôn Thất Tùng, Hồ Đắc Di, Nguyễn Mạnh Tường, Nguyễn Văn Huyên, Trần Đức Thảo, có những nhà hoạt động chính trị Phạm Văn Đồng, Võ Nguyên Giáp, Phan Thanh... Hầu hết những trí thức này đều học trường Pháp ra, mà sao tinh thần dân tộc rất cao và năm 1945 tuyệt đại bộ phận họ đều đi theo cách mạng để chống lại thực dân Pháp. Điều đó tựa hồ mâu thuẫn với quan niệm phổ biến xưa nay là nhà trường thực dân chỉ cốt đào tạo ra những người làm tay sai cho thực dân. Trong khi đó, các thế hệ trí thức được đào tạo sau này ở Liên Xô và các nước xã hội chủ nghĩa cũ một cách bài bản, lớn lên trong nền giáo dục thấm nhuần lý tưởng xã hội chủ nghĩa cao đẹp, hằng ngày được gián tiếp hay trực tiếp bồi dưỡng tinh thần yêu nước, yêu chủ nghĩa xã hội, yêu lao động, ghét bóc lột, xả thân vì dân vì nước... mà sao có vẻ như phẩm chất không được như ta kỳ vọng. Dường như có cái gì không thật, có cái gì chưa ổn lắm, cho nên gặp hoàn cảnh không thuận lợi thì bộc lộ nhiều nhược điểm. Chúng ta có biết bao tiến sĩ, giáo sư và gần đây rộ lên cả mấy tá viện sĩ (chức danh này chưa có ở VN, nhưng nếu muốn trưng ra thì cả nước hiện nay cũng có thể trưng ra cả nghìn viện sĩ kiểu này chứ không ít), rồi lại có cả những “bộ óc vĩ đại thế kỷ 21”, nhiều nhân vật trí thức xuất chúng đến nỗi đang có kế hoạch phải dành 25 hecta đất vào thời buổi đất quý hơn vàng, để xây một Văn Miếu hiện đại mới đủ chỗ vinh danh bấy nhiêu bậc đại trí. Thế nhưng có ai dám chắc cái gia tài trí thức lớn ấy sau này sẽ được con cháu hoan nghênh khi đất nước đến hồi hưng thịnh? Đó là cái nghịch lý cần phân tích và lý giải khi bàn về giáo dục và đào tạo. Riêng tôi nghĩ rằng nền giáo dục, văn hóa Pháp mà thế hệ trí thức tiền bối 30-45 đã được hưởng thật sự là một nền giáo dục tiên tiến thời đó. Cái phần thực dân trong nền giáo dục ấy chỉ là cái vỏ ngoài do bọn thực dân áp đặt ở thuộc địa mà cũng chỉ có tác dụng rất hạn chế, còn cái phần nhân văn, cái phần văn hóa cơ bản, cái phần thật sự là tinh túy trong triết lý giáo dục của nó thời đó thì ai tiếp thu được đều tốt cho họ, cho đất nước họ, cho nhân dân họ, không cứ là cho người Pháp, cho nước Pháp. Có lẽ chính vì nhìn thấy điều ấy mà Phan Chu Trinh đã sáng suốt đề ra: hưng dân trí, chấn dân khí, hậu dân sinh. Giờ đây khi mà văn hóa, giáo dục đã lệch pha quá xa với kinh tế, đã đến lúc chúng ta phải suy nghĩ nghiêm túc về đường lối, triết lý giáo dục, chứ không phải chỉ bàn chuyện nay hai không, mai năm không, v.v. Những việc này cũng cần làm để khởi động dạo đầu cho công cuộc cải cách, nhưng sa đà vào đó mà quên đi cái cốt lõi sẽ có tác dụng ngược lại. Không thể máy móc vơ đũa cả nắm, nhưng có một sự thật là dường như phần lớn những cán bộ được đào tạo ở Liên Xô và các nước xã hội chủ nghĩa trước đây đều thiếu căn bản về văn hóa phổ quát. Tư duy của họ chỉ phát triển theo một đường ray mà hễ ai trật ra là nguy hiểm. Cho nên trừ những trường hợp hãn hữu, họ thường chỉ là những chuyên viên kỹ thuật được trang bị một số vốn kiến thức kỹ thuật, chuyên môn hẹp nào đó, ở thời đó, và cũng rất mau lạc hậu, nhưng thiếu một nhãn quan rộng, thiếu một tầm nhìn ra ngoài ngành nghề hẹp của mình, cho nên bị hạn chế ngay trong việc phát triển chuyên môn, và càng bị hạn chế đứng trước những vấn đề xã hội, văn hóa không thuộc phạm vi chuyên môn hẹp của mình. Mỗi người chỉ biết việc của mình, chỉ lo cho mình, ít khả năng và cũng không thích thú hợp tác với bạn bè đồng nghiệp. Dễ bị lâm vào thế ếch ngồi đáy giếng, dễ mắc bệnh vĩ cuồng, không hòa nhập vào dòng chảy văn minh của thời đại, không chấp nhận luật chơi quốc tế, rồi ngày càng tụt hậu mà vẫn tự ru ngủ mình, tự đánh lừa mình, và đánh lừa nhân dân mình với những thành tích không có thật. Chạy theo danh hão, chạy theo quyền lực, chạy theo chức tước, là căn bệnh thời đại của trí thức VN. Chưa bao giờ trong xã hội ta có nhiều Xuân Tóc Đỏ như bây giờ. Tôi nói có vẻ bi quan, nhưng thà nhìn khắt khe một chút để biết người biêt ta, còn hơn nhắm mắt chủ quan một cách lố bịch. Những sai lầm làm tha hóa giáo dục. Trở lại vấn đề giáo dục hiện nay của ta, điều tôi lo lằng nhất là sự tha hóa trầm trọng của nó. Nói khủng hoảng nhưng nét chính của khủng hoảng ấy là sự tha hóa, biến chất. Giáo dục có nguy cơ trở thành phản giáo dục. Có nhiều nguyên nhân nhưng trực tiếp làm tha hóa giáo dục có ba sai lầm lớn mà tôi gọi là sai lầm hệ thống trong quản lý giáo dục. Có thể nói không quá đáng tất cả những căn bệnh trầm trọng: gian dối, tiêu cực, dối trá, lãng phí, quan liêu… hiện đã đi vào xương tủy của giáo dục mà không một phong trào “nói không” nào có thể chữa trị được đều có nguồn gốc sâu xa liên quan tới sai lầm trong chính sách đối với người thầy. 1. Chính sách đối với người thầy. Đó là sai lầm đầu tiên và tai hại nhất do quan niệm lệch lạc về sứ mạng và vai trò người thầy trong nền giáo dục hiện đại. Phản ứng lại tư duy lạc hậu trong nhà trường cũ, gán cho thầy quyền uy tuyệt đối, biến giáo dục thành quá trình truyền đạt và tiếp thu hoàn toàn thụ động, là đúng. Nhưng từ đó đã xuất hiện tư duy cực đoan ngược lại, phủ nhận vai trò then chốt của thầy đối với chất lượng giáo dục. Với cách hiểu giáo dục thô sơ nặng về cảm tính, khi thì nhấn mạnh một chiều “học sinh là trung tâm”, khi khác tôn chương trình, sách giáo khoa lên địa vị “linh hồn giáo dục”, nhận định chất lượng đại học thấp “không phải do thầy mà do chương trình”, v.v. dẫn đến hoàn toàn xem thường việc xây dựng đội ngũ thầy giáo theo chuẩn mực chuyên môn và đạo đức hiện đại. Trong mọi khâu từ tuyển chọn đến sử dụng và bồi dưỡng người thầy, khâu nào cũng phạm sai lầm lớn. Đặc biệt tệ hại là chính sách lương. Ngay từ đầu đã bỏ qua kinh nghiệm muôn thuở “có thực mới vực được đạo”, trả lương cho thầy cô giáo dưới mức sống hợp lý, lấy cớ ngân sách eo hẹp (thật ra chỉ là do tham nhũng và sử dụng ngân sách không hợp lý), bỏ mặc các thầy cô “tự cứu” kiếm thêm thu nhập bằng mọi cách (dạy thêm, làm thêm, đến nỗi không hiếm giảng viên đại học dạy sô trên 30 giờ/tuần). Có thể nói không quá đáng tất cả những căn bệnh trầm trọng: gian dối, tiêu cực, dối trá, lãng phí, quan liêu… hiện đã đi vào xương tủy của giáo dục mà không một phong trào “nói không” nào có thể chữa trị được đều có nguồn gốc sâu xa liên quan tới cái lỗi hệ thống cơ bản này. 2. Tập trung tất cả việc dạy và học vào thi cử, nói rõ hơn là thay vì thi, kiểm tra thường xuyên nghiêm túc từng học phần để bảo đảm kết quả học tập vững chắc và thực chất thì dồn hết cố gắng vào các kỳ thi tốt nghiệp, thi “quốc gia” nặng nề, căng thẳng, rất hình thức mà thiếu nghiêm túc, sinh ra hội chứng thi rất đặc biệt của giáo dục VN: gần thi mới lo học, học đối phó, học nhồi nhét chỉ cốt để thi, thi cái gì học cái nấy, thi thế nào học thế ấy, chủ yếu là học thuộc lòng các loại bài mẫu, các đáp án mẫu. Trước đây thi theo bộ đề thi cho sẵn, nay bộ đề thi biến tướng thành các bảng “cấu trúc đề thi”. Nghĩa là tư duy có thay đổi gì đâu, hai mươi năm trời, tốn bao công nghiên cứu, cuối cùng trở lại gần như điểm xuất phát, dưới một hình thức có vẻ mới để che dấu một phương pháp cổ lỗ. Lại còn chuyện thi trắc nghiệm, thi tự luận. Người ta thi trắc nghiệm với một mục đích khác, ta không nghiên cứu kỹ, đưa ra áp dụng đại trà vào thi tốt nghiệp THPT trong khi trình độ chuyên nghiệp về kiểu thi này còn chưa bảo đảm, cho nên gây tốn kém và làm khổ cả học sinh lẫn thầy giáo. Rồi đùng một cái cấm các trường không được áp dụng hình thức trắc nghiệm khi thi học kỳ, làm cả thầy và trò hoang mang, không hiểu giáo dục là cái gì mà có thể quản lý tùy tiện như thế. Đem việc học phụ thuộc vào việc thi, khiến thi chứ không phải học trở thành hoạt động giáo dục chủ yếu, đến mức muốn hiểu thực chất giáo dục VN như thế nào chỉ cần quan sát hoạt động của nhà trường và xã hội trong mùa thi. Từ kiểu thi nhiêu khê đẻ ra những dịch vụ kỳ lạ hiếm thấy: kỹ nghệ “phao” thi, thi thuê, viết luận án thuê, làm bằng giả, bằng thật nhưng học giả, v.v. Cho nên chừng nào còn duy trì kiểu học và thi này thì xã hội còn phải trả giá nặng nề cho sự tụt hậu của giáo dục. Chưa kể nếu tính hết mọi khoản chi trực tiếp và gián tiếp phục vụ cho các kỳ thi thì lãng phí lên tới con số khủng khiếp, bình thường đã khó chấp nhận, với tình hình kinh tế khó khăn như lúc này càng khó chấp nhận hơn. Nhiều nước như Trung Quốc hay Hàn Quốc, thi còn nhẹ nhàng hơn ta mà họ đã phê phán cái “địa ngục thi cử” của họ, còn thi cử như ta không biết phải gọi là cái địa ngục gì. 3. Chạy theo số lượng, hy sinh chất lượng, bất chấp mọi chuẩn mực, thông lệ và kinh nghiệm quốc tế, khiến việc hội nhập khó khăn và không cạnh tranh nổi ngay với các nước trong khu vực. Đây chính là bệnh thành tích, chứ không là gì khác. Phát triển số lượng thì dễ, nhất là khi người dân còn khát học tập như trong xã hội ta. Chỉ đảm bảo chất lượng mới khó, vậy nên cứ chọn cái dễ mà làm, dễ gây ấn tượng, dễ báo cáo thành tích. Trên đã vậy thì làm sao chống được bệnh thành tích ở dưới. Trong hoàn cảnh ấy mà có người còn bênh vực bệnh thành tích, viện lẽ chỉ nhấn mạnh chất lượng lúc này là xa xỉ (! ), thì thật không hiểu nổi ta muốn phát triển giáo dục và khoa học theo kiểu nào. Nguy hại là căn bệnh này nghiêm trọng nhất ở cấp đại học và đào tạo thạc sĩ, tiến sĩ, tuyển chọn, công nhận GS, PGS. Trong thời đại toàn cầu hóa, muốn hội nhập thành công, phải hiểu biết và tôn trọng luật chơi, trước hết là các quy tắc, chuẩn mực, thông lệ quốc tế. Thế nhưng từ các chuẩn mực thông thường nhất về cơ sở vật chất, đội ngũ giảng dạy, cho đến việc tuyển sinh thạc sĩ, tiến sĩ, đánh giá công trình nghiên cứu khoa hoc, đánh giá các luận văn thạc sĩ, tiến sĩ, tuyển chọn, đánh giá GS, PGS, đánh giá các đại học... phần lớn đều không theo những chuẩn mực quốc tế mà dựa vào những tiêu chí tự sáng tác, nặng về cảm tính thô sơ, rất thấp và rất khác so với quốc tế, thiếu khách quan, thiếu căn cứ khoa học, thiếu minh bạch, dễ bị lợi dụng mưu lợi ích riêng cho từng nhóm thay vì phục vụ sự nghiệp chung. Sự thiếu hiểu biết và coi thường các chuẩn mực quốc tế thể hiện trong mọi chủ trương xây dựng đại học, cho đến gần đây nhất vẫn rất chủ quan. “Điếc không sợ súng” đó là căn bệnh cố hữu của ngành giáo dục. Tất cả các sai lầm hệ thống nêu trên khiến giáo dục dần dần biến chất, xuống cấp, xa rời tất cả những giá trị cao quý còn sót lại từ quá khứ. Xu hướng tha hóa ấy phát triển có nguy cơ đẻ ra một nền giáo dục phản giáo dục. Theo đề án đổi mới thi và tuyển sinh của Bộ GD-ĐT, từ sau kỳ thi tuyển sinh đại học lần cuối cùng vào năm 2009 sẽ chỉ còn một kỳ thi trung học phổ thông quốc gia mà kết quả sẽ được sử dụng làm một trong những căn cứ để xét vào đại học. Như vậy, để chuẩn bị cho đợt tuyển sinh năm 2010, việc đưa ra các phương án tuyển sinh phù hợp với mục tiêu đào tạo của từng trường nhất thiết phải đặt ra ngay từ lúc này. Cho đến nay, đã có khá nhiều phương án được đề cập cho việc tuyển sinh từ năm 2010. Chẳng hạn, các trường có thể xét tuyển dựa trên kết quả của một số môn thi trong kỳ thi THPT, có hoặc không có trọng số; tự tổ chức thêm kỳ thi tuyển sinh cho một số môn học để lấy kết quả xét tuyển; hoặc xét kết hợp điểm thi THPT và kết quả học tập ở THPT. Hai phương án có tính đổi mới hơn là sử dụng kết quả của một kỳ thi theo kiểu SAT để bổ sung thêm căn cứ xét tuyển; và cuối cùng là ghi danh tự do cho mọi đối tượng đã hoàn tất THPT. Tất cả các phương án vừa nêu đều đã và đang được áp dụng ở nơi này hay nơi khác trên thế giới. Vấn đề đặt ra cho Việt Nam hiện nay là nên chọn phương án hoặc tập hợp các phương án nào, và tại sao? Bài viết này nhằm giới thiệu các nhóm yếu tố thường được xem xét trong chính sách tuyển sinh của các trường đại học trên thế giới, phân tích mục tiêu mà các yếu tố này nhắm đến, trên cơ sở đó đề xuất một phương án tuyển sinh đại học và cao đẳng từ năm 2010 tại Việt Nam. Có 4 nhóm yếu tố thường được xem xét khi xây dựng một hệ thống tuyển sinh đại học trên thế giới (1) kết quả của các kỳ thi, (2) kết quả học tập ở trung học phổ thông; (3) hồ sơ xin học, và (4) các yếu tố dân số như giới tính, dân tộc, tuổi tác, và điều kiện kinh tế - xã hội của người học. Mỗi nhóm yếu tố được sử dụng nhằm đạt những mục tiêu khác nhau. Đây là nhóm yếu tố được sử dụng phổ biến nhất trong mọi hệ thống tuyển sinh trên thế giới. Các kỳ thi được sử dụng gồm thi TN THPT; thi tuyển sinh đại học; và kỳ thi chuẩn hóa (standarrdised test, tương tự như SAT của Hoa Kỳ), trong đó hai kỳ thi TN THPT và tuyển sinh đại học là phổ biến hơn cả. Kỳ thi chuẩn hóa có thể nói là sản phẩm đặc thù của nền giáo dục Hoa Kỳ và hiện cũng đang được một số quốc gia chịu ảnh hưởng của giáo dục Hoa Kỳ và có điều kiện tương tự Hoa Kỳ áp dụng. Mỗi kỳ thi nêu trên nhắm đến một mục tiêu khác nhau; tuy nhiên hai kỳ thi TN THPT và tuyển sinh đại học có nhiều điểm chung vì đều dựa vào chương trình học ở trung học phổ thông. Thi TN THPT nhằm xác nhận người học đã đạt mức tối thiểu của trình độ THPT, còn thi tuyển sinh đại học nhằm chọn lọc những người có kiến thức và kỹ năng tốt nhất trong các thí sinh. Kỳ thi chuẩn hóa theo kiểu SAT trái lại thường không dựa vào các kiến thức và kỹ năng đã được cung cấp trong chương trình đào tạo ở THPT, mà hoặc có tính đặc thù hoặc tổng quát hơn, nhằm đánh giá khả năng thành công của thí sinh khi vào học ở bậc đại học. Do khác nhau về mục tiêu nên các kỳ thi nêu trên cũng thuộc thẩm quyền quản lý của các cơ quan khác nhau. Thi tốt nghiệp THPT thường do nhà nước (có thể ở cấp quốc gia hoặc cấp địa phương) quản lý, nhằm bảo đảm giáo viên và học sinh hoàn tất mọi yêu cầu tối thiểu của chương trình đào tạo. Thi tuyển sinh đại học thường do chính trường đại học thực hiện để lấy kết quả làm cơ sở ra quyết định về việc lựa chọn thí sinh trong trường hợp số chỗ học ít hơn số người muốn học. Ở một số quốc gia trên thế giới, tuyển sinh đại học cũng do nhà nước quản lý, đặc biệt là đối với hệ thống giáo dục đại học công, vì có sử dụng ngân sách nhà nước. Trong khi đó, kỳ thi chuẩn hóa là một hoạt động chuyên môn có tính dịch vụ nhằm giúp người học chứng minh khả năng học tập của mình, vì vậy thường do các tổ chức khảo thí chuyên nghiệp thực hiện. Các tổ chức này thường độc lập với cơ quan quản lý nhà nước, và có thể thuộc các trường đại học (vd: ĐH Cambridge của Anh, hoặc ĐH Michigan của Hoa Kỳ), hoặc cũng có thể nằm ngoài các trường. Việc sử dụng kết quả của kỳ thi này như một căn cứ để xét tuyển tùy thuộc vào sự lựa chọn của từng trường dựa trên giá trị của chính các kỳ thi này trong việc giúp nhà trường lựa chọn được thí sinh tốt nhất để đào tạo. Việc sử dụng kỳ thi nào trong phương án tuyển sinh hoàn toàn tùy thuộc vào mục tiêu và điều kiện của từng quốc gia cũng như từng trường đại học cụ thể. Những quốc gia phát triển như nhiều nước ở Châu Âu hoặc các nước Bắc Mỹ, nơi có một hệ thống giáo dục phổ thông có chất lượng tốt và có đầy đủ chỗ học ở đại học cho mọi người thì hầu như chỉ cần kỳ thi tốt nghiệp THPT; việc có thêm một kỳ thi tuyển sinh hoặc kỳ thi chuẩn hóa là vấn đề thuần túy chuyên môn và vì vậy sẽ do từng trường quyết định. Tuy nhiên, ở các hệ thống giáo dục đại học có sự phân biệt rõ ràng giữa đại học công (được nhà nước đầu tư và thường có chất lượng cao hơn) và đại học tư (người học đóng học phí và chất lượng thường kém hơn các đại học công) như ở Nhật Bản, Hàn Quốc thì sự cạnh tranh vào trường đại học công vẫn hết sức gay gắt; vì vậy, các kỳ thi thực sự có vai trò gác cổng (gatekeeping) và việc tổ chức thêm một hoặc thậm chí thêm nhiều kỳ thi khác sau kỳ thi TN THPT rõ ràng là điều cần thiết để loại bớt những thí sinh mà các trường không có khả năng để nhận. Các kỳ thi lớn dù có được tổ chức nghiêm túc đến đâu, và dù có tổ chức bao nhiêu kỳ thi đi nữa, cũng chỉ đánh giá được phần nào kiến thức và năng lực của một học sinh, mà chủ yếu là kiến thức sách vở và năng lực hàn lâm. Trong khi đó, việc quá nhấn mạnh vào các kỳ thi có vai trò gác cổng như trên có thể là nguyên nhân dẫn đến những tiêu cực trong thi cử, làm mất hoàn toàn ý nghĩa của việc tổ chức thi, chưa kể sự căng thẳng đối với người học và gia đình, sự tốn kém công sức và tiền bạc của toàn xã hội, vv. Vì vậy, ở một số nước tiên tiến trên thế giới, thay vì tổ chức nhiều kỳ thi tốn kém để lấy kết quả tuyển sinh, các trường đại học có thể sử dụng kết quả học tập ở bậc phổ thông (xét học bạ) để kết hợp hoặc độc lập đánh giá khả năng thành công ở bậc đại học của các ứng viên. Sử dụng kết quả học tập ở bậc phổ thông để xét tuyển vào đại học là một cách làm tiên tiến về nhiều mặt. Trước hết, cách làm này thể hiện quan điểm phát triển, vì học bạ cho phép nhìn nhận sự năng lực của người học qua suốt một quá trình, chứ không chỉ ở điểm cuối, giúp phát hiện những học sinh có nỗ lực cải thiện, có năng khiếu hoặc sự say mê đặc biệt đối với ngành học, và thông qua các nhận xét của giáo viên có thể cho phép bộc lộ tính cách lẫn các mối quan hệ của học sinh trong suốt thời gian học tập ở bậc phổ thông. Điều này sẽ cho phép các trường đại học có được quyết định đúng đắn hơn đối với quá trình tuyển sinh. Bên cạnh đó, việc xem xét kết quả ở bậc phỏ thông trong quá trình tuyển sinh cũng thể hiện quan điểm dân chủ và hợp tác trong giáo dục. Với cách làm này, quyền đánh giá người học đã được các trường đại học trao về cho các giáo viên phổ thông, là những người trực tiếp giáo dục và có thể tạo ra những thay đổi quan trọng ở học sinh. Việc xem xét học bạ ở phổ thông ở đầu vào và sau đó theo dõi quá trình học ở bậc đại học của một sinh viên sẽ tạo ra sự liền mạch trong quá trình giáo dục từ trung học lên đại học, đồng thời cũng tạo điều kiện cho quá trình hợp tác giữa trường đại học và trường phổ thông trong quá trình giáo dục. Tuy có những ưu điểm như vậy, song việc xét học bạ trong tuyển sinh thường không được sử dụng phổ biến ở những nước đang phát triển vốn không có một nền giáo dục đại học đại chúng. Điều này là do sự thiếu thống nhất về quan điểm đánh giá khiến kết quả tại các trường trung học phổ thông có thể rất khác nhau và không thể so sánh để tạo cơ hội công bằng cho mọi người, trong điều kiện không có đủ chỗ học cho mọi người muốn học. Tại một nước như Việt nam với nhiều rất nhiều bất cập, thiếu thốn trong giáo dục phổ thông, nơi có được tấm bằng đại học vẫn hầu như là cánh cửa vào đời duy nhất đối với thanh niên, thì việc xét tuyển vào đại học bẳng kết quả học tập ở bậc phổ thông cần phải thực sự cân nhắc trước khi sử dụng, và nhất thiết phải sử dụng kết hợp với những yếu tố khác có tính khách quan hơn như các kỳ thi đã nêu ở phần trên. Học bạ ở phổ thông chỉ bao gồm những thông tin về người học do các giáo viên và nhà trường cung cấp, trong khi hồ sơ xin học còn có những thông tin do chính người học cung cấp. Thông thường, trong hồ sơ xin học ngoài học bạ còn có thêm những thông tin sau đây về người học: lý lịch tự thuật, quá trình làm việc (nếu có), thư tự giới thiệu nêu lý do chọn trường và mục tiêu của việc học, và một hoặc nhiều thư giới thiệu của những người có khả năng đánh giá tính cách và năng lực của người học (chẳng hạn các giáo viên, hiệu trưởng trường trung học, các cơ quan, tổ chức bên ngoài nhà trường đã từng tiếp xúc hoặc làm việc với ứng viên). Sử dụng hồ sơ xin học như một yếu tố để xét tuyển là một bước tiến xa hơn của quá trình dân chủ hóa và hợp tác trong giáo dục. Nếu việc xét học bạ cho phép giáo viên và trường trung học phổ thông tham gia vào việc đánh giá người học thì hồ sơ xin học cho phép người học tự xây dựng hình ảnh về năng lực của chính mình thông qua các thông tin do chính mình chọn lọc và cung cấp. Một hồ sơ xin học với đầy đủ các thành phần như vừa nêu không chỉ cho thấy học lực của người học mà còn cho phép đánh giá về khả năng diễn đạt, lập luận và thuyết phục, quan điểm và sự trưởng thành, sự say mê đối với ngành học của người học vv. Cách làm này vì vậy rất phù hơp với một số ngành đặc thù đòi hỏi sự đam mê hoặc/ và kinh nghiệm cũng như bản lãnh của người học, đặc biệt là những người hoc ngoài lứa tuổi truyền thống, là những điều rõ ràng không thể bộc lộ qua những điểm số trong học bạ hoặc kết quả của những kỳ thi. Điểm bất lợi lớn nhất của cách làm này là nếu số lượng thí sinh quá lớn thì quá trình đọc và xét hồ sơ sẽ đòi hỏi khá nhiều thời gian và công sức của trường đại học. Ngoài ra, một bất lợi khác là các ứng viên không thành công thường không có điều kiện để biết lý do của sự thất bại của mình để cải thiện khi cần. Ba nhóm yếu tố vừa nêu – thi cử, học bạ, hồ sơ xin học – chủ yếu liên quan đến năng lực, đặc biệt là năng lực trí tuệ, chứ không liên quan đến các yếu tố về nhân thân của người học, như giới tính, tuổi tác, nhóm xã hội, địa phương vv. Điều này là cần thiết để đảm bảo sự công bằng trong việc lựa chọn theo nguyên tắc người có năng lực cao nhất sẽ có cơ hội cao nhất để được lựa chọn. Tuy nhiên, xét ở góc độ xã hội, các nhóm đối tượng thiệt thòi (dân tộc thiểu số, nữ giới, dân cư vùng sâu vùng xa, các nhóm có thu nhập thấp vv) sẽ luôn có nguy cơ bị loại cao hơn các nhóm khác, dẫn đến sự bất bình đẳng kéo dài cho các đối tượng này. Ngoài ra, sự đa dạng (diversity) về mặt dân số của người học cũng là một điều kiện cần thiết để tạo một môi trường phát triển toàn diện cho sinh viên trong các trường đại học. Chính vì vậy, các yếu tố dân số cũng thường được xem xét như một yếu tố bổ sung trong phương án tuyển sinh của nhiều trường đại học trên thế giới. Việc xem xét các yếu tố dân số trong việc tuyển chọn ứng viên vào trường đại học có thể do chính nhà trường quyết định, hoặc do các chính sách xã hội chung của nhà nước. Ở Hoa Kỳ và một số nước tiên tiến khác, các trường có thể tuyên bố trước các “định mức” (quota) về tỷ lệ phần trăm nữ giới hoặc dân tộc thiểu số sẽ được ưu tiên tuyển vào trường để khuyến khích các đối tượng này tham gia dự tuyển. Khi xét tuyển, các đối tượng này sẽ được xét riêng theo thứ tự từ trên xuống dưới trong cùng nhóm, nhưng không xét chung với các nhóm không ưu tiên, để đảm bảo luôn tuyển đủ chỉ tiêu đã định. Khi sử dụng các yếu tố dân số trong tuyển sinh, cần ghi nhớ rằng sự công bằng xã hội sẽ không thể đạt được nếu như các ứng viên được ưu tiên tuyển vào trường lại không thể thành công trong quá trình học. Vì vậy, việc xét tuyển theo các yếu tố dân số luôn kèm theo ít nhất là 1 trong các yêu cầu sau: (1) ứng viên phải có được năng lực tối thiểu để tham gia chương trình (vd: đã tốt nghiệp THPT ở mức trung bình khá trở lên); (2) nhà trường có điều kiện và kế hoạch để hỗ trợ sinh viên diện ưu tiên khi đã được chọn vào học để đảm bảo sự thành công của sinh viên; (3) nhà trường có chính sách giúp sinh viên “có lối thoát” khi có nguy cơ không thể hoàn tất chương trình trong hạn định (vd: cho phép chuyển sang ngành học phù hợp hơn, chuyển xuống trình độ thấp hơn, cho phép tạm ngưng và quay trở lại học khi có điều kiện vv). Trong 3 yêu cầu vừa nêu, yêu cầu cuối cùng là điều tối thiểu mà một trường phải thực hiện được cho các đối tượng ưu tiên, và điều này không khó vì chỉ điều kiện cần duy nhất là có một hệ thống đào tạo theo tín chỉ với các chính sách liên thông rõ ràng để giải quyết yêu cầu cuối cùng này. Do các trường và các ngành đào tạo có các mục tiêu và yêu cầu khác nhau nên không thể có một phương án tuyển sinh tối ưu chung cho tất cả mọi người, mà cần thiết phải có phân biệt giữa các nhóm trường/ngành khác nhau. Điều này cũng tạo điều kiện cho việc đẩy mạnh phân tầng (stratification) giáo dục đại học ở Việt Nam, vốn là điều hết sức cần thiết trong quá trình đại chúng hóa giáo dục đại học trên toàn thế giới hiện nay. 1. Nhóm 1: Các trường/ngành không đặc thù, không có tính cạnh tranh cao, và/ hoặc không sử dụng kinh phí của nhà nước: Sử dụng kết quả thi TN THPT và xét học bạ. Nhóm này bao gồm đa số các trường trung học chuyên nghiệp, cao đẳng công lập và ngoài công lập, các trường đại học tư thục, và một số trường đại học công thuộc khối ngành xã hội (bao gồm cả kinh tế-luật) và nhân văn (trừ ngoại ngữ). Đối với nhóm này, phương án tốt tốt nhất là xét tuyển trên cơ sở các môn thi TN THPT kết hợp với học bạ THPT. Việc xét học bạ THPT có thể thực hiện ngay từ khi học sinh đang ở học kỳ 2 của lớp 11 với kết quả sơ tuyển (thay thế cho việc đăng ký nguyện vọng hiện nay) được báo trước cho ứng viên vào khoảng cuối HK 1 năm lớp 12. Trên cơ sở các ứng viên đã được sơ tuyển, nhà trường có thể hình dung ra số lượng sinh viên tiềm năng của từng ngành đào tạo để chuẩn bị các điều kiện cần thiết cho năm học mới. Các ứng viên sẽ được nhận chính thức khi nộp kết quả kỳ thi TN THPT theo các yêu cầu cần đạt do nhà trường đưa ra. Đa số các đối tượng ưu tiên sẽ được xét trong nhóm này tại các trường công lập (đặc biệt là các thí sinh khối C hiện nay), với tỷ lệ xét tuyển ưu tiên trong toàn bộ thí sinh được công bố trước cho mọi thí sinh biết. Việc xét tuyển phải xét theo nguyên tắc từ cao xuống thấp và xét riêng các đối tượng ưu tiên cho đến khi đủ chỉ tiêu. 2. Nhóm 2: Các trường/ngành đặc thù, có tính cạnh tranh cao, đòi hỏi năng lực/ năng khiếu đặc biệt của người học, và/ hoặc nhận được sự đầu tư đặc biệt của nhà nước: Sử dụng kết quả của kỳ thi TN THPT (có hoặc không kèm theo việc xét học bạ) và kết quả của một kỳ thi khác. Nhóm 2 gồm đa số các trường đại học công lập, đặc biệt là các đại học trọng điểm; các chương trình tiên tiến, tài năng, chất lượng cao, các chương trình liên kết với nước ngoài thuộc các trường đại học cả công lập và ngoài công lập, các ngành đòi hỏi phòng thí nghiệm, thiết bị và điều kiện học tập đặc biệt như y, nha, một số ngành kỹ thuật, một số ngành học đặc thù/năng khiếu như mỹ thuật, kiến trúc, nhạc, họa, ngoại ngữ vv. Đối với nhóm này, việc sơ tuyển có thể thực hiện tương tự nhóm 1 với những điều kiện khắt khe hơn (vd: chỉ xét các học sinh đạt loại giỏi, hoặc học sinh thuộc các trường chuyên, trường trọng điểm, chương trình chất lượng cao vv). Tuy nhiên, sau khi có kết quả TN THPT theo các yêu cầu cần đạt do nhà trường đưa ra (thường ở mức cao hơn nhóm 1), nhất thiết phải có thêm một kỳ thi, hoặc là kỳ thi đầu vào do chính nhà trường tổ chức, hoặc là một kỳ thi chuẩn hóa (đặc thù hoặc tổng quát, theo kiểu SAT của Hoa Kỳ, hoặc O level của Anh) do một tổ chức khảo thí chuyên nghiệp trong hoặc ngoài nước tổ chức. Do đây là nhóm ngành học đặc thù, đòi hỏi thí sinh phải năng lực/ năng khiếu tối thiểu để thành công, nên mức điểm đạt tối thiểu của kỳ thi này phải được xác định trước và công bố cho mọi thí sinh được biết để tự lượng sức. Tuy nhiên, việc trúng tuyển sẽ được xét từ trên xuống dưới đối với tất cả các trường hợp đạt điểm sàn. Các đối tượng ưu tiên nếu muốn được xét trong nhóm này vẫn cần phải dự đầy đủ các kỳ thi và đạt mức điểm tối thiểu đã được công bố trước để đảm bảo khả năng thành công của thí sinh khi trúng tuyển. Việc xét tuyển cũng xét theo nguyên tắc từ cao xuống thấp và xét riêng các đối tượng ưu tiên cho đến khi đủ chỉ tiêu. Đối tượng sinh viên được phép theo học các hệ đào tạo đặc biệt chỉ nên bao gồm các thí sinh ngoài độ tuổi truyền thống (18-24). Do đây là đối tượng đã hoàn toàn trưởng thành và thường đã có kinh nghiệm làm việc, nên hồ sơ xin học sẽ là căn cứ quan trọng nhất để phán đoán về khả năng thành công trong chương trình học. Ngoài hồ sơ xin học, các thí sinh này cũng cần có yêu cầu tối thiểu về trình độ (vd: đã hoàn tất chương trình THPT). Các yếu tố dân số đối với đối tượng này cũng rất quan trọng, không chỉ với mục đích ưu tiên mà chủ yếu để tạo một môi trường đa dạng trong học tập vốn rất cần thiết đối với đối tượng ở độ tuổi phi truyền thống. Ngoài ra, tùy yêu cầu của từng ngành học, nhà trường có thể yêu cầu thí sinh cung cấp thêm thêm kết quả của một kỳ thi chuẩn hóa được tổ chức nhiều lần trong năm để tạo điều kiện cho thí sinh theo học bất cứ khi nào đủ điều kiện. Do điều kiện đầu vào khá mở nên việc quản lý đối với đối tượng này cần rất chặt chẽ thông qua việc kiểm tra thường xuyên trong quá trình học theo nguyên tắc mở rộng đầu vào, thắt chặt đầu ra. Đồng thời, do tiến độ học tập của các sinh viên sẽ rất đa dạng, nên một cơ chế quản lý linh hoạt là hết sức cần thiết. Ở đây, một lần nữa có thể thấy một hệ thống tín chỉ hoàn chỉnh, vận hành tốt, với các cơ chế liên thông được đảm bảo, là một điều kiện rất cần cho sự thành công của người học trong chương trình đào tạo. Vai trò quan trọng của trường đại học trong nền kinh tế tri thức toàn cầu hiện nay không còn gì để bàn cãi. Nhưng để trường đại học thực sự là một động lực phát triển xã hội thì mọi chính sách có liên quan đến quá trình giáo dục đều cần được cân nhắc cẩn thận, trong đó tuyển sinh là khâu quan trọng đầu tiên. Và hai nguyên tắc quan trọng nhất trong việc xây dựng các chính sách của một ngành có liên quan đến tất cả mọi người là ngành giáo dục là phải xem xét quyền lợi của tất cả các bên có liên quan, và thực hiện trao quyền khi đã có đủ điều kiện. Các đề xuất được đưa ra trong bài viết này, dựa trên kinh nghiệm thực tiễn của các nước trên thế giới, đã cố gắng tôn trọng các nguyên tắc nói trên, và hy vọng có thể chỉ ra được một số định hướng phù hợp để tiếp tục nâng cao chất lượng và hiệu quả của giáo dục đại học Việt Nam trong những năm sắp đến. 1. Bộ Giáo dục và Đào tạo (2007). Tài liệu Hội thảo – Tập huấn về thi năm 2008 (lưu hành nội bộ). Hà Nội, Cục Khảo thí và Đánh giá chất lượng đào tạo. 2. Cabrera, A. F., and K. R. Burkum (2001) College Admission Criteria in the United States: An Overview. Paper presented at Balance del sistema de acceso a la universidad (selectividad y modelos alternativos). Cátedra UNESCO de Gestión y Política Universitaria. Madrid, Spain. 3. Helms, R. M. (2008) University Admission Worldwide. Working Paper Series 15. Washington D.C., World Bank. 4. Oregon State Board of Higher Education (2007). Undergraduate Admission Policy for 2008-2009 Academic Year.